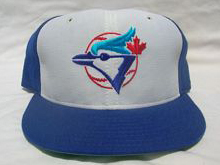 1977 expansion brought MLB to Canada'a largest city. 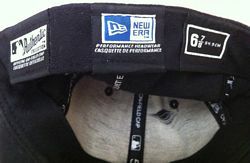 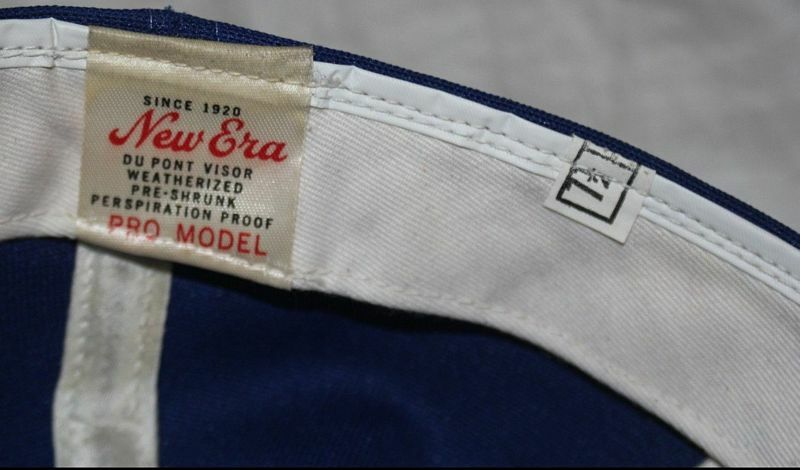 The team has worn New Era exclusively since its inception. 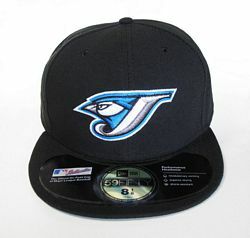 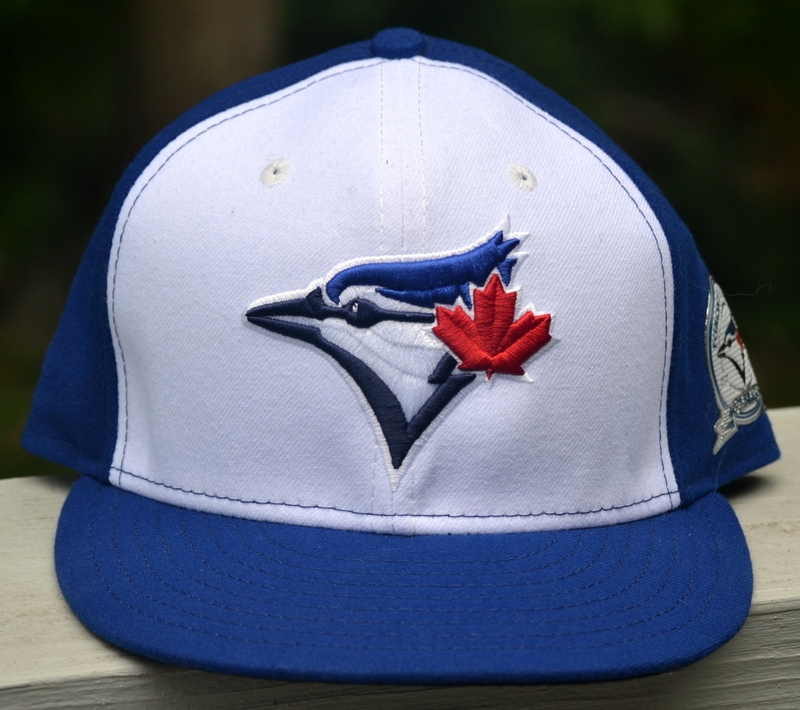 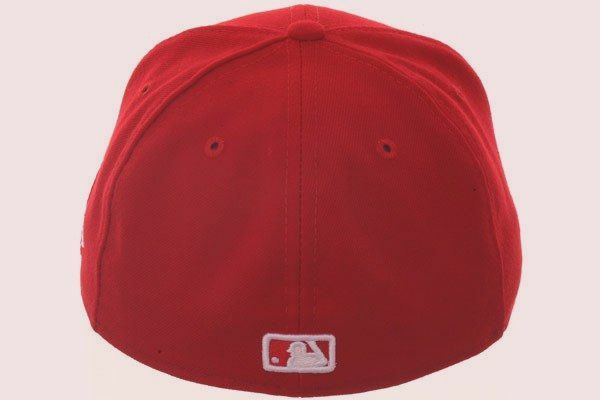 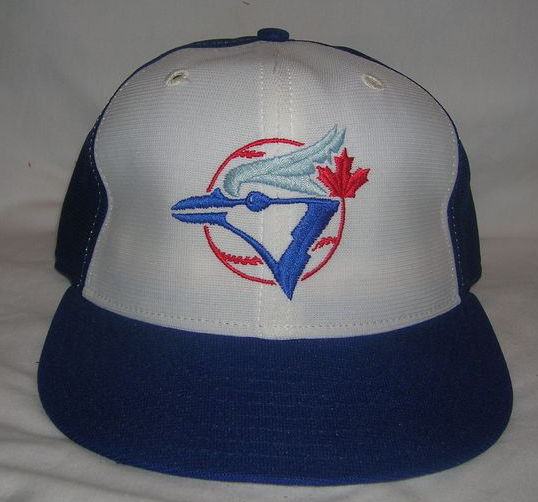 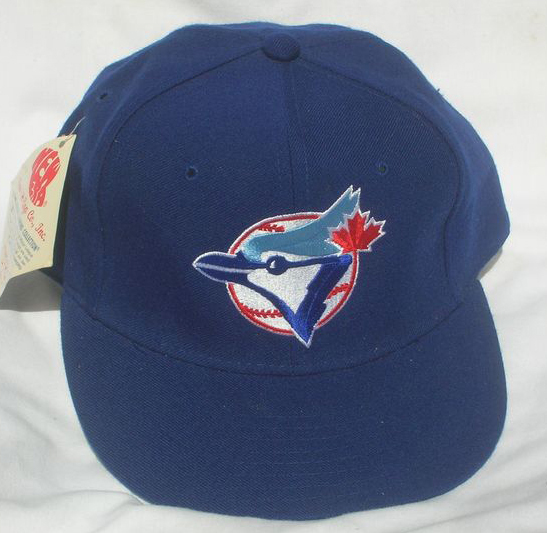 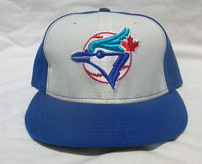 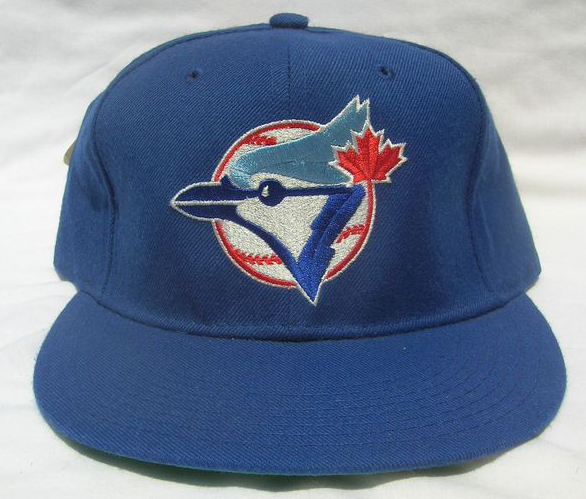 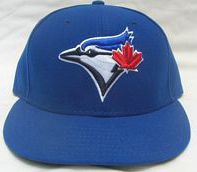 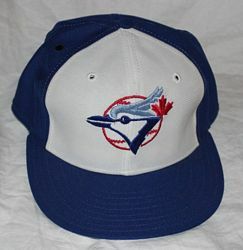 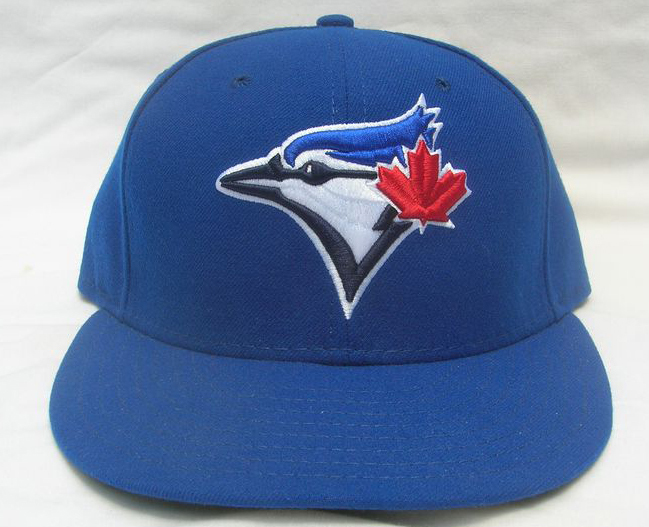 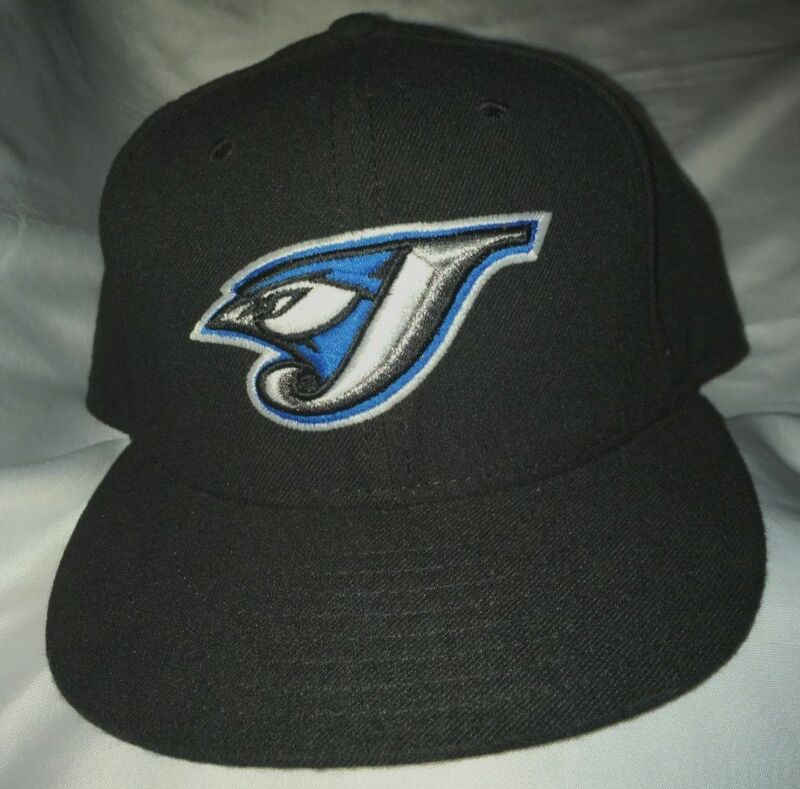 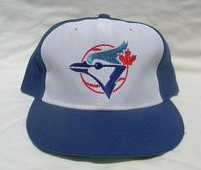 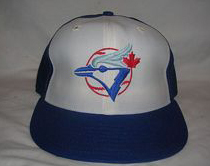 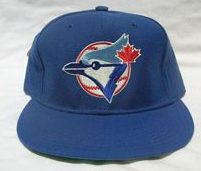 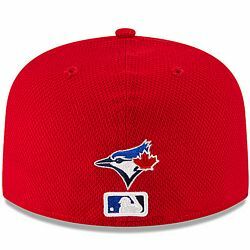 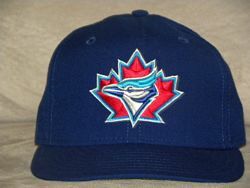 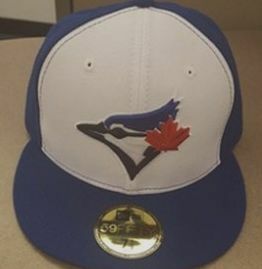 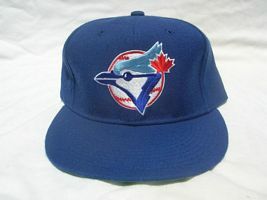 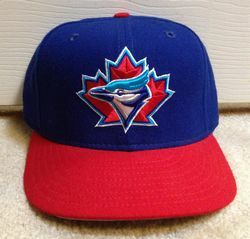 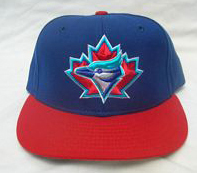 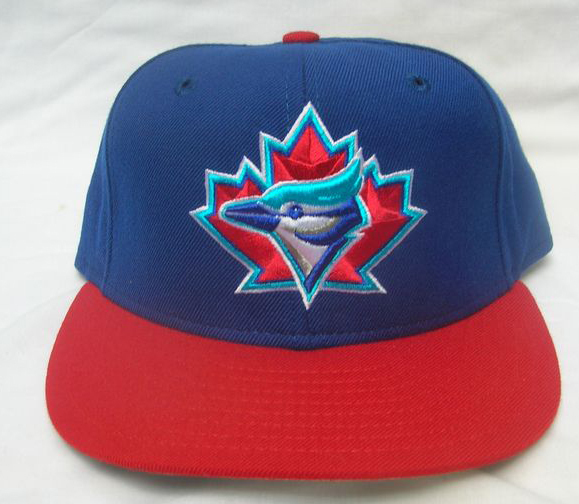 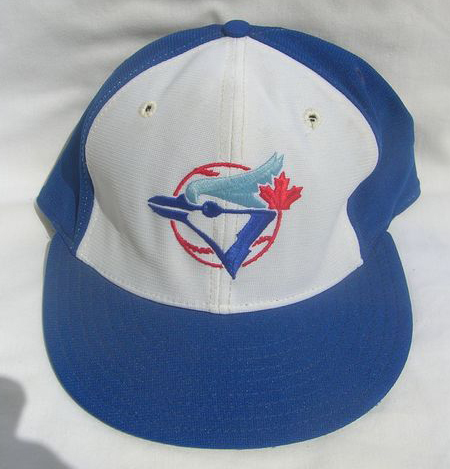 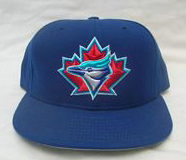 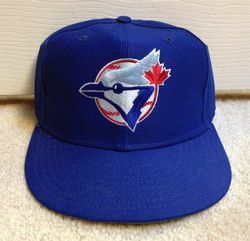 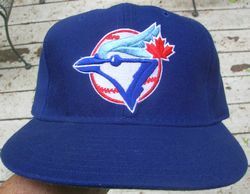 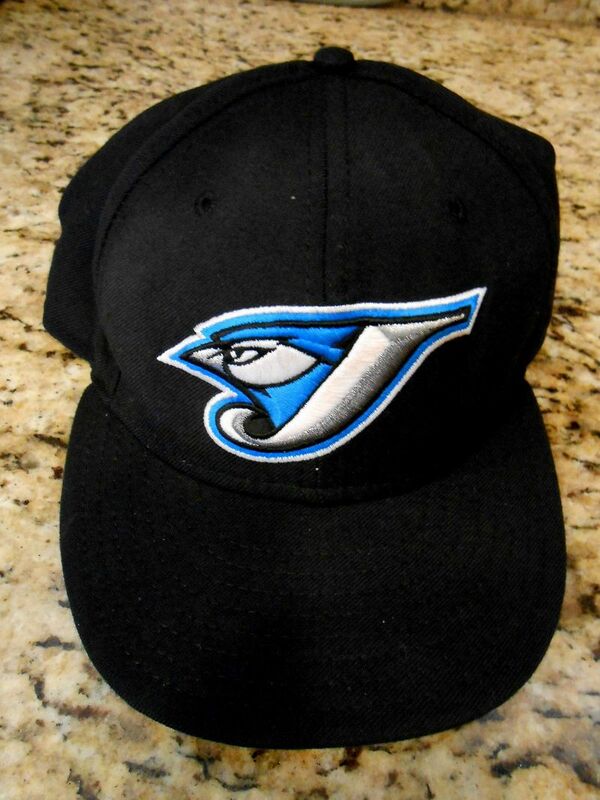 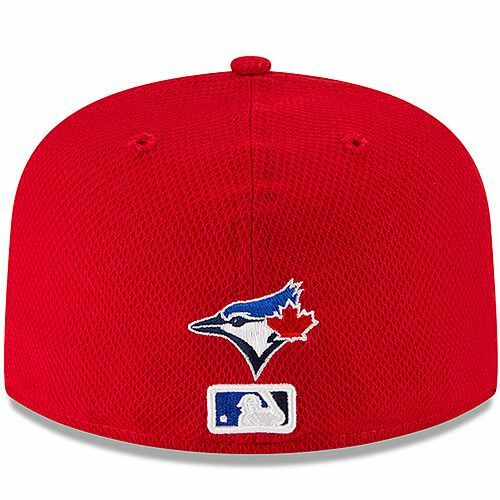 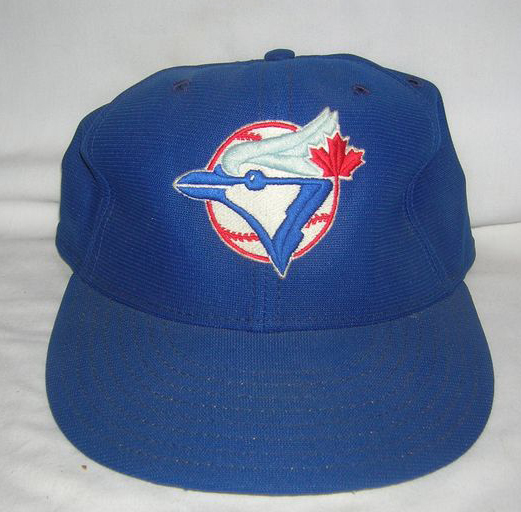 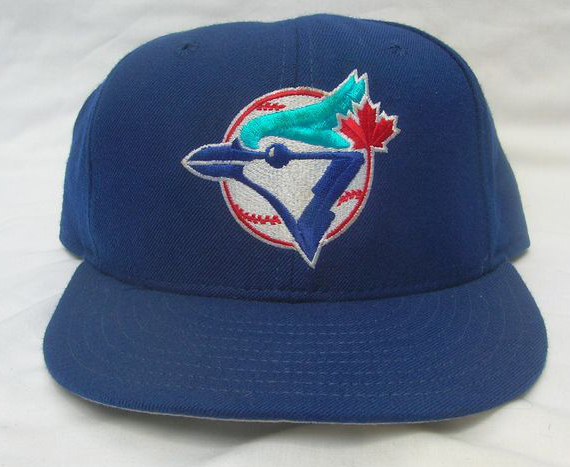 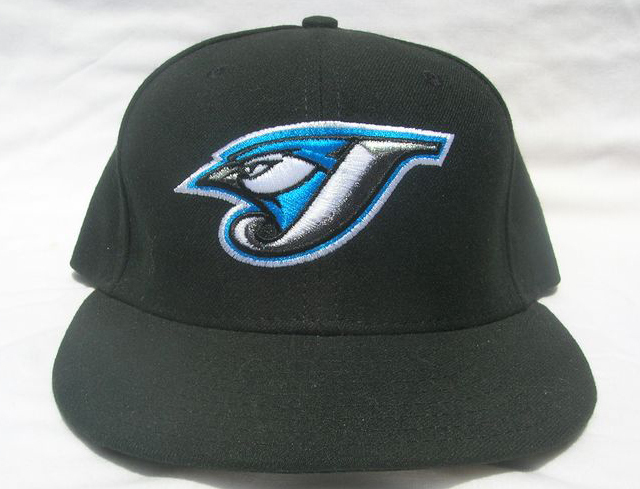 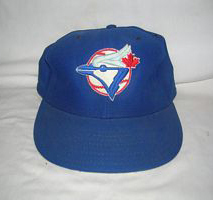 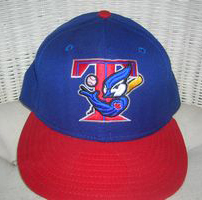 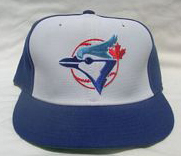 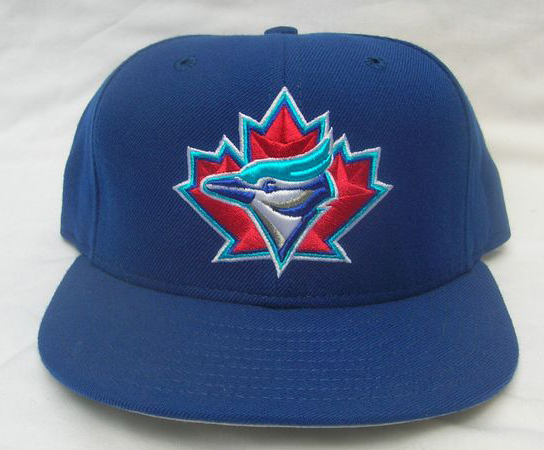 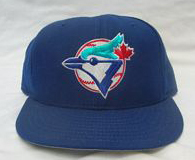 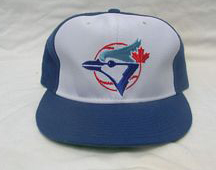 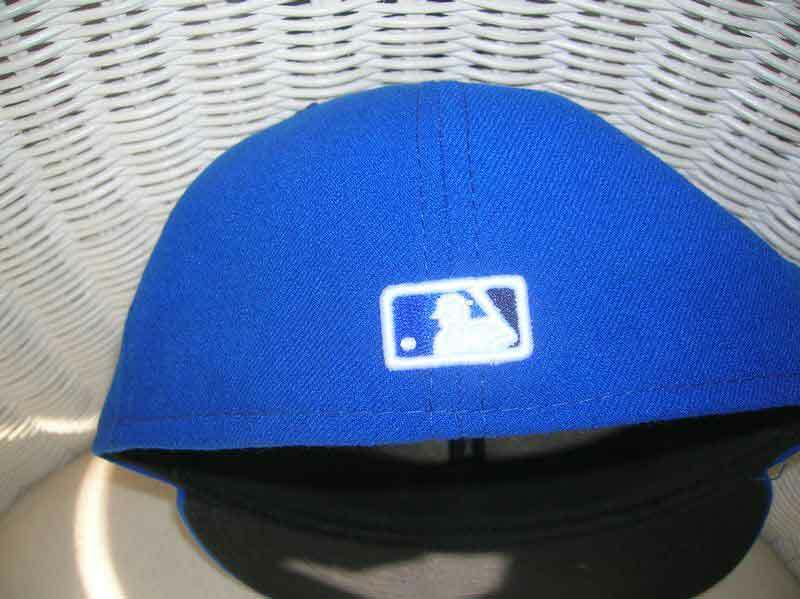 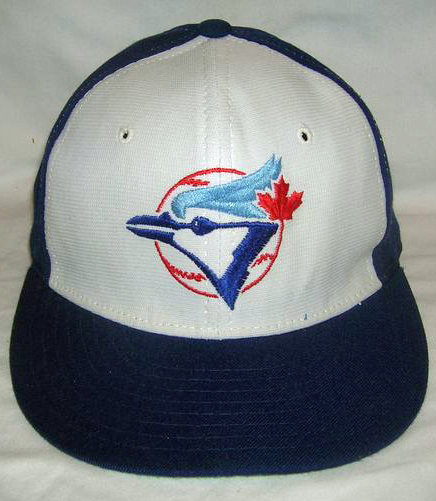 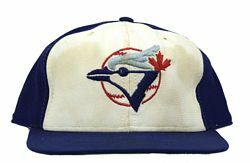 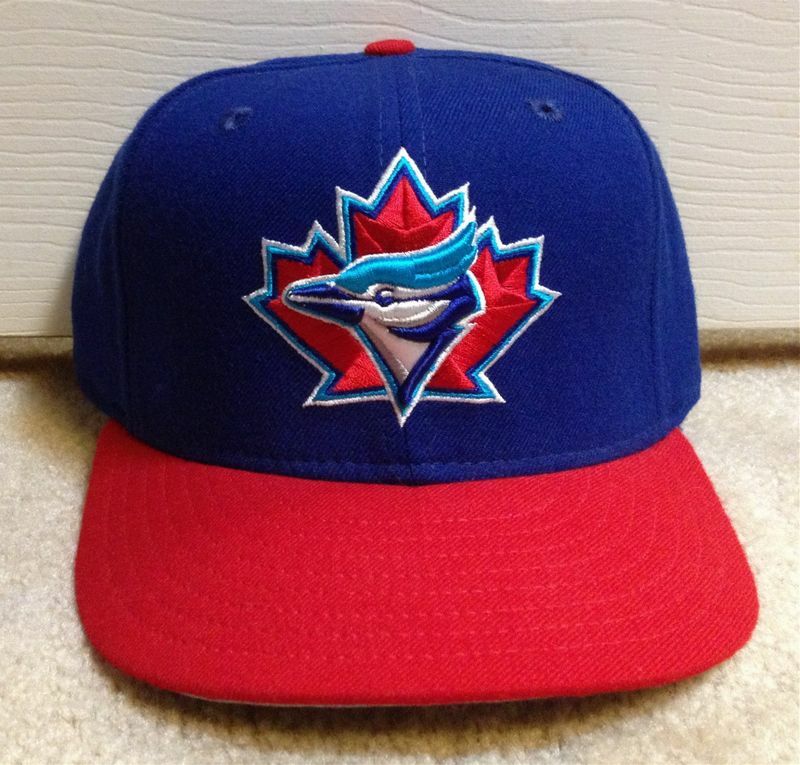 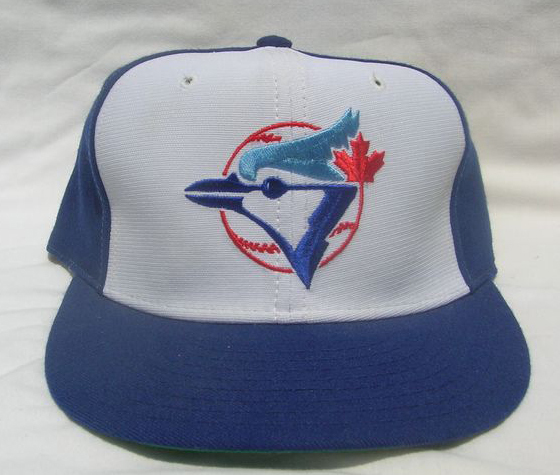 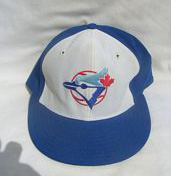 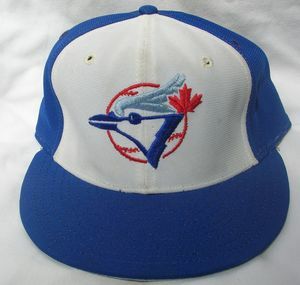 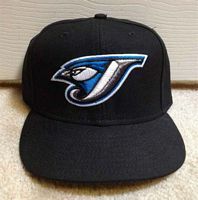 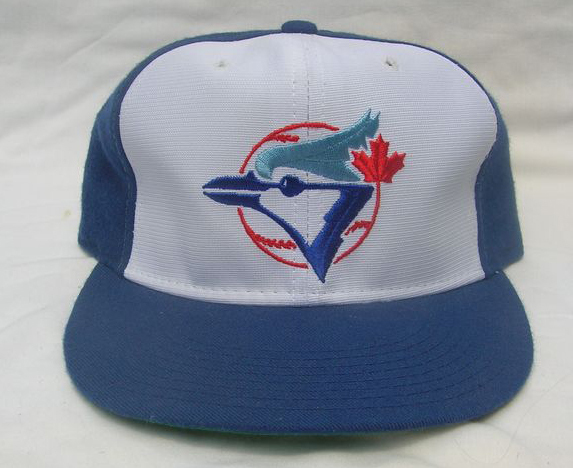 The Jays are only the second MLB team (besides Baltimore) using a logo with no letters on its cap. The first caps that went on sale to the public in 1976 were wool as shown here. 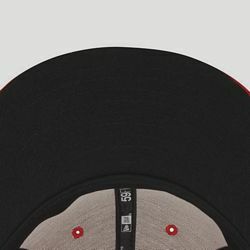 The first on-field caps are wool with nylon white front panels. 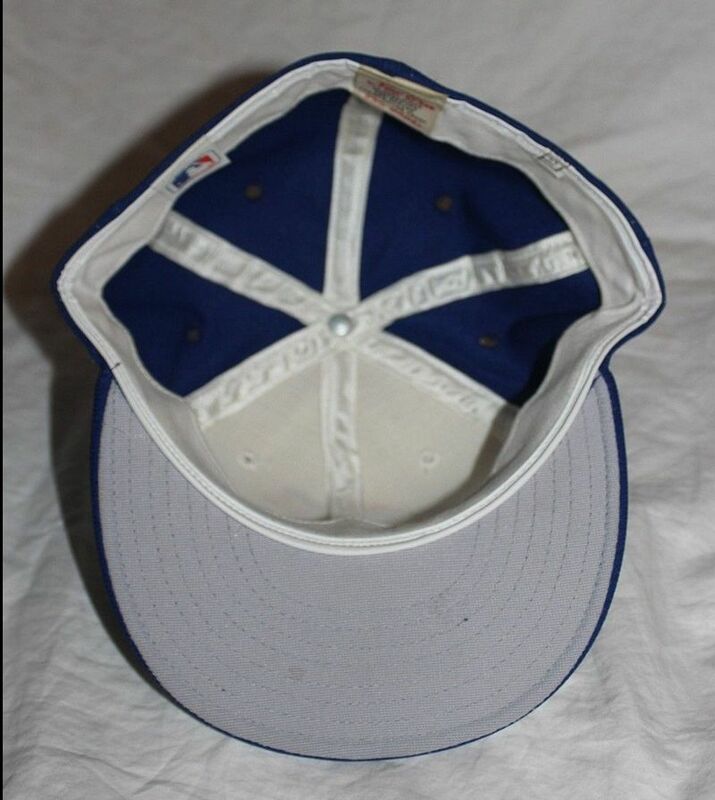 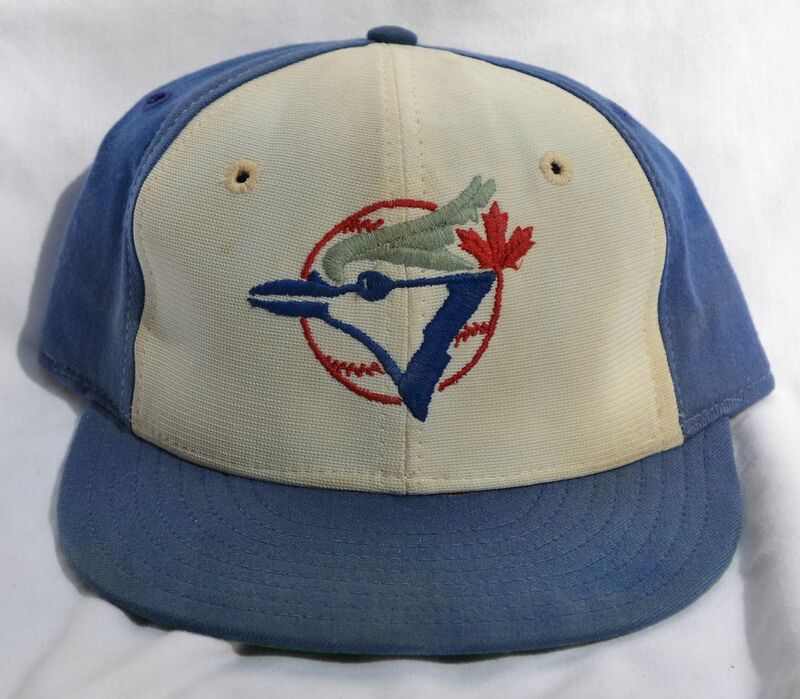 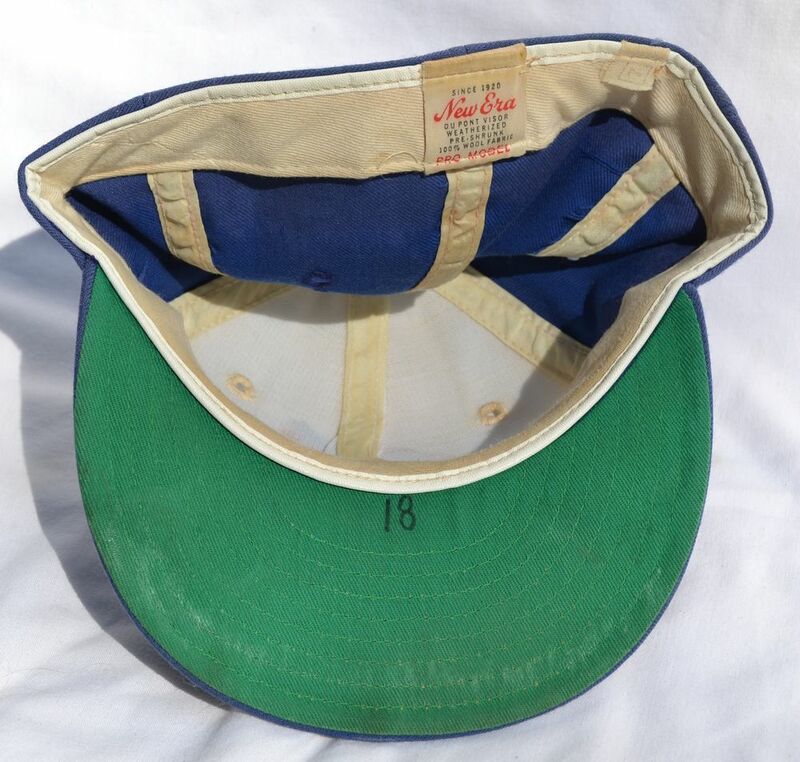 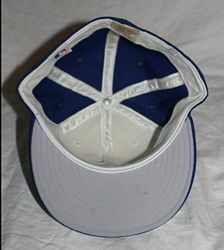 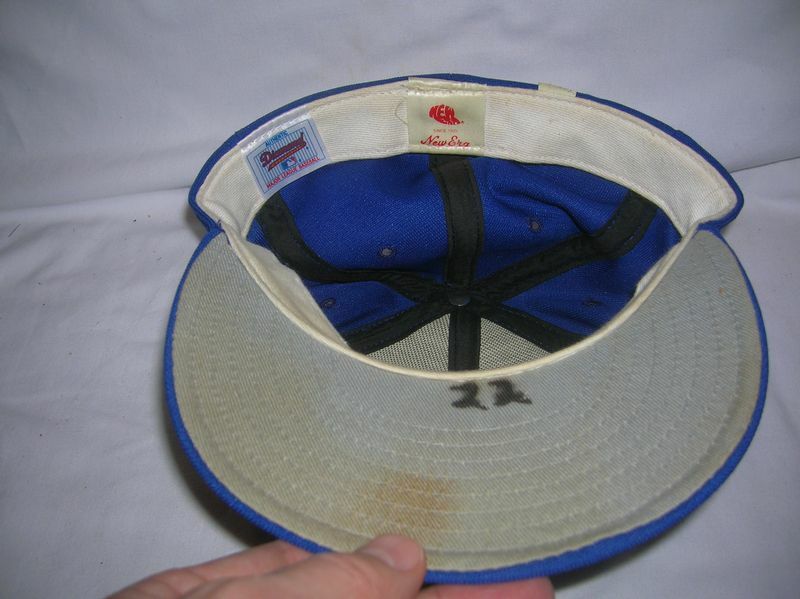 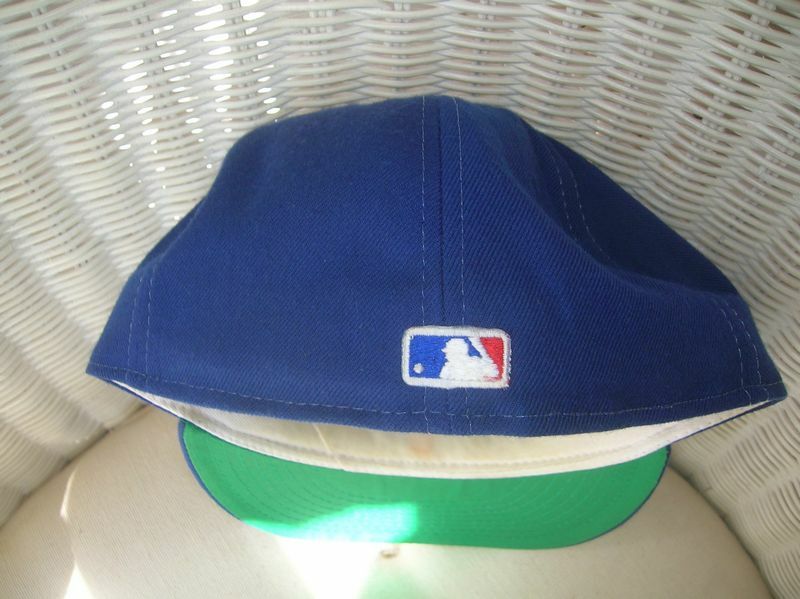 Here's Jim Clancy's cap. 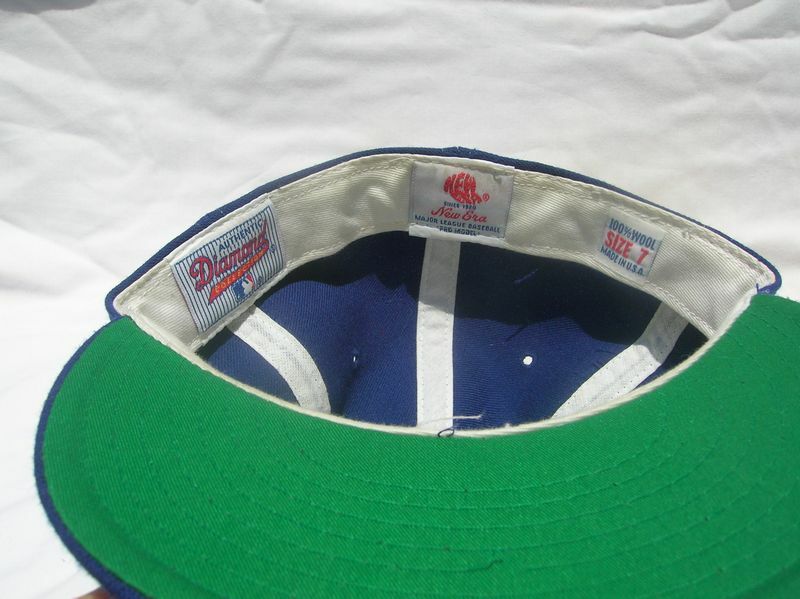 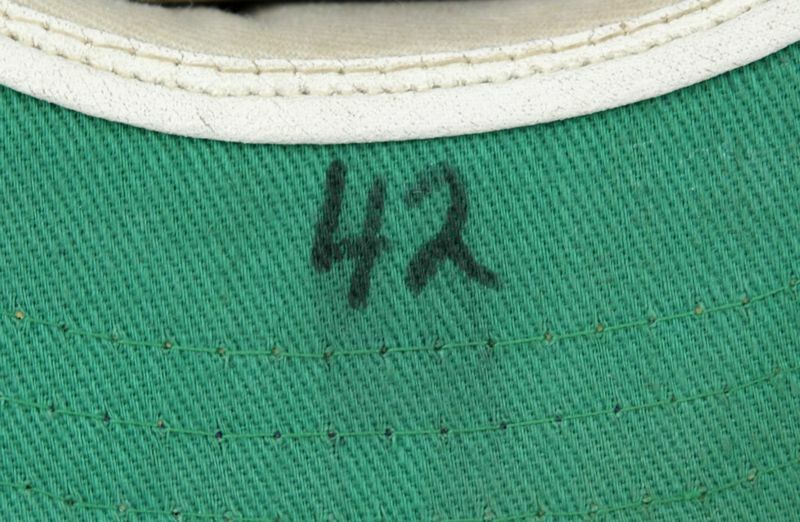 In 1978, caps switched to all nylon, like this one from coach Jackie Moore. Grey underbrims appear in 1979. 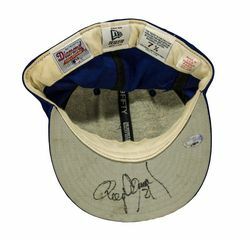 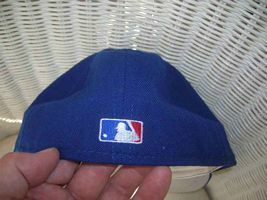 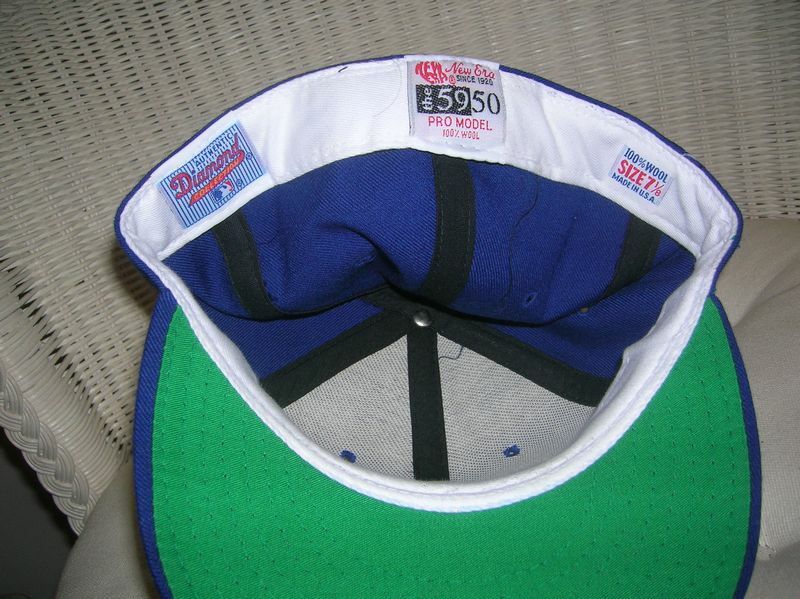 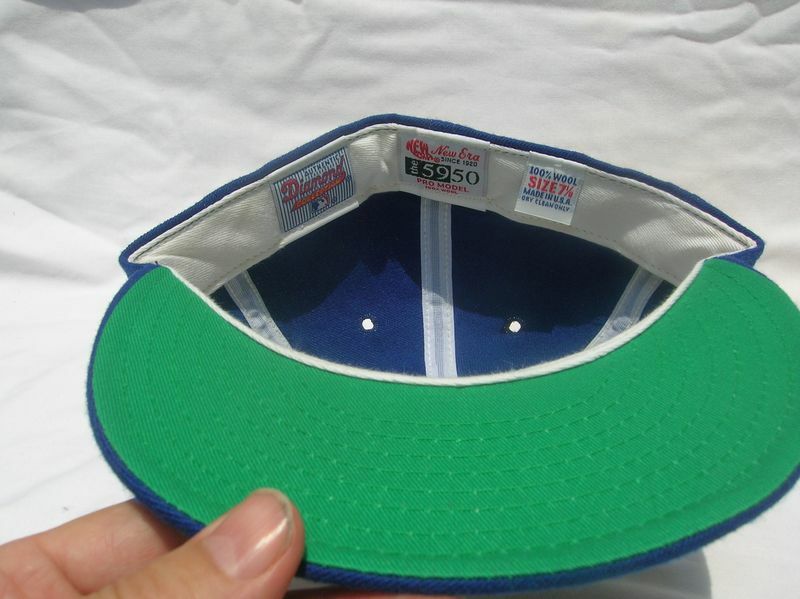 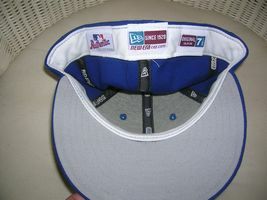 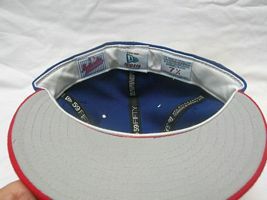 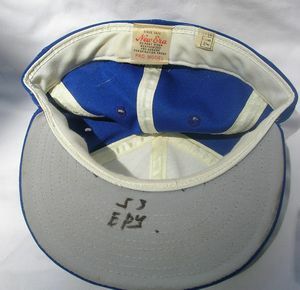 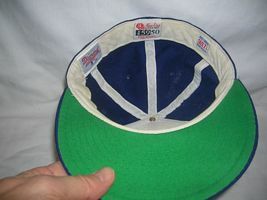 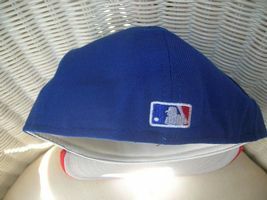 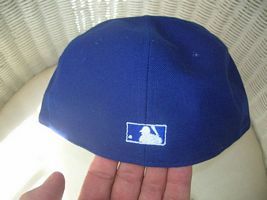 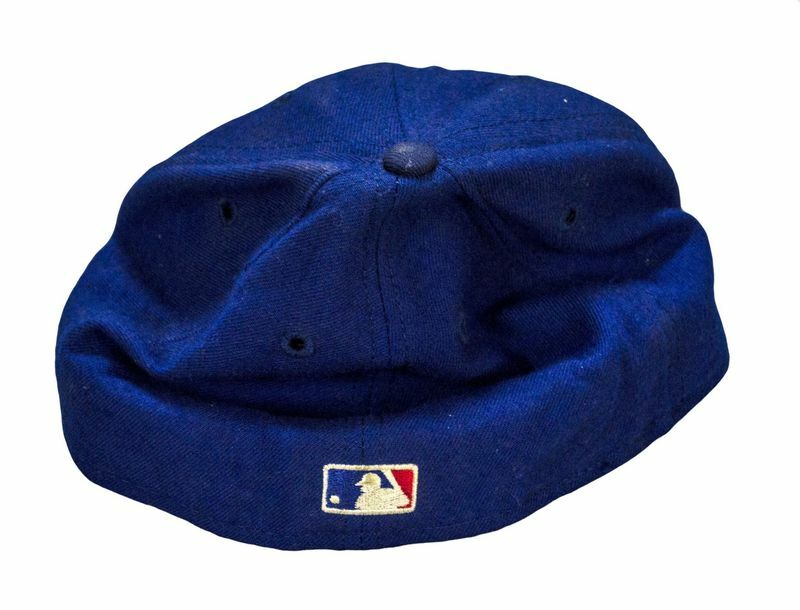 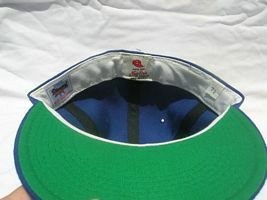 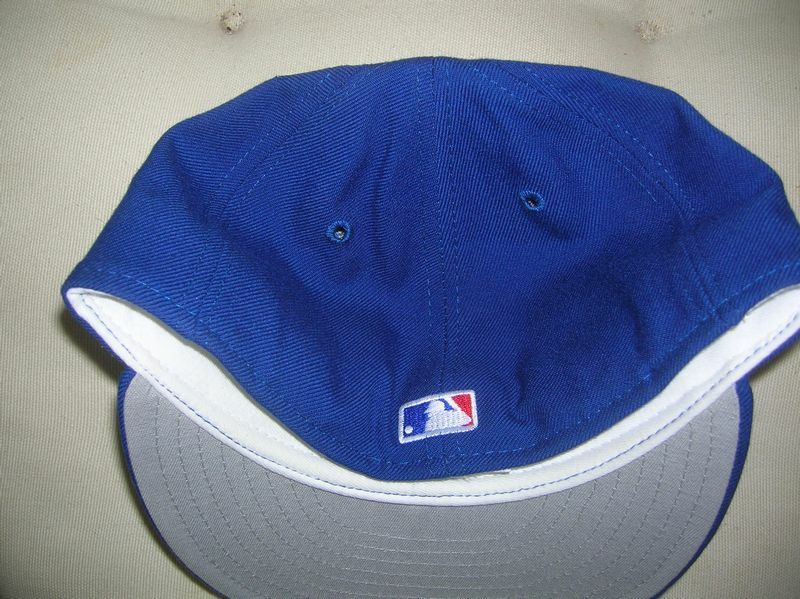 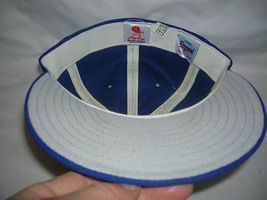 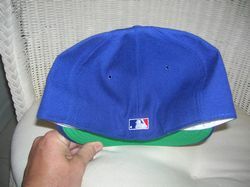 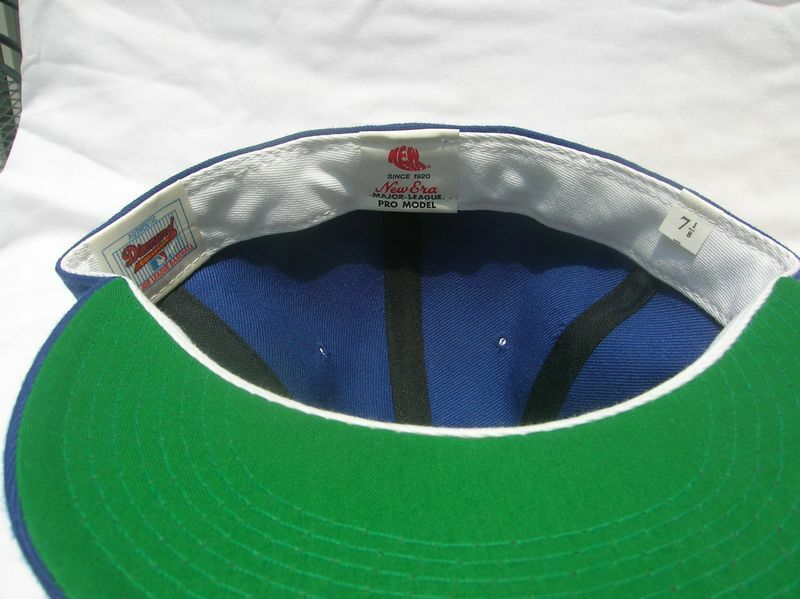 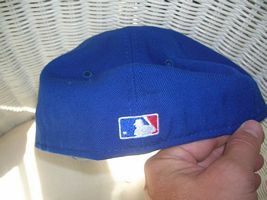 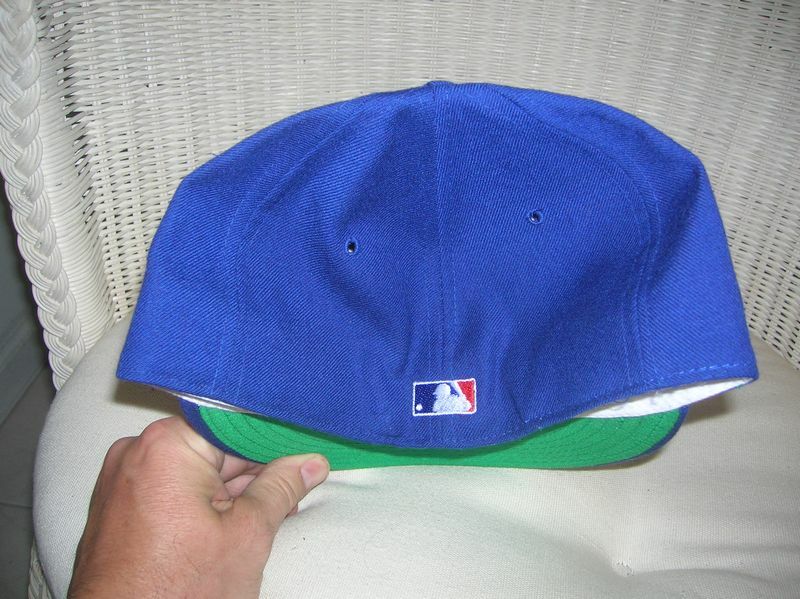 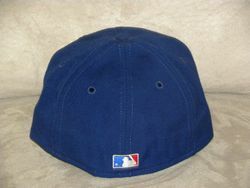 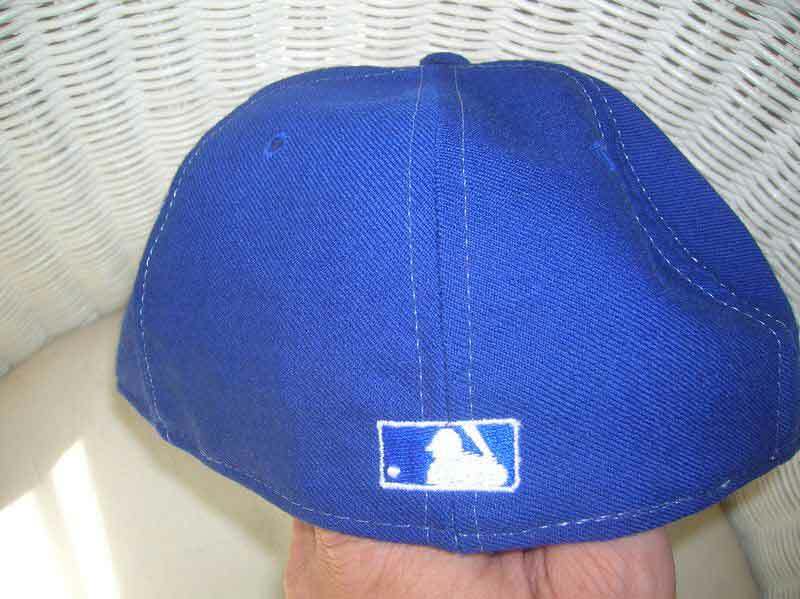 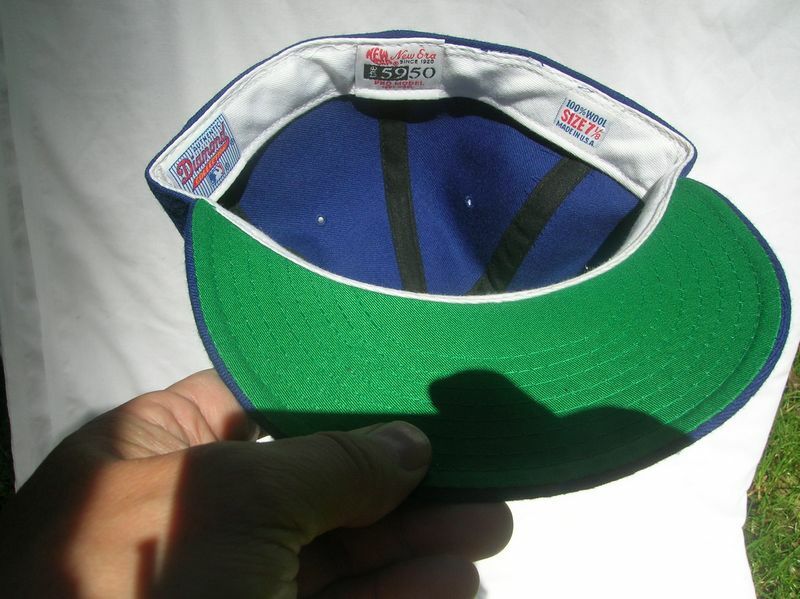 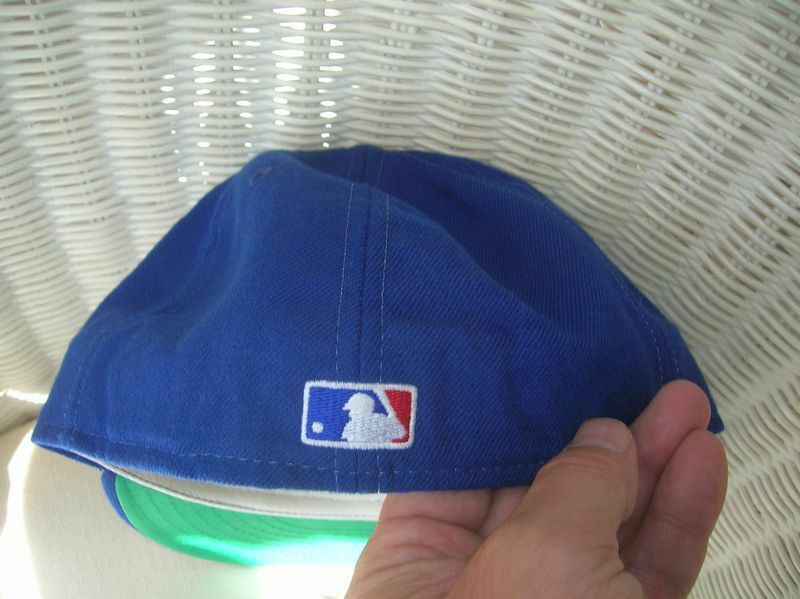 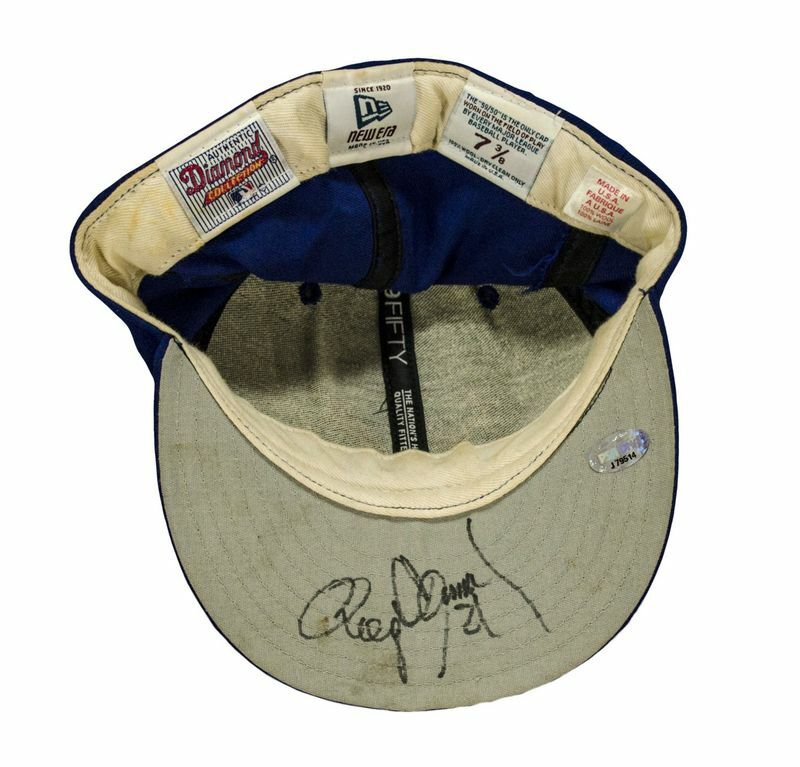 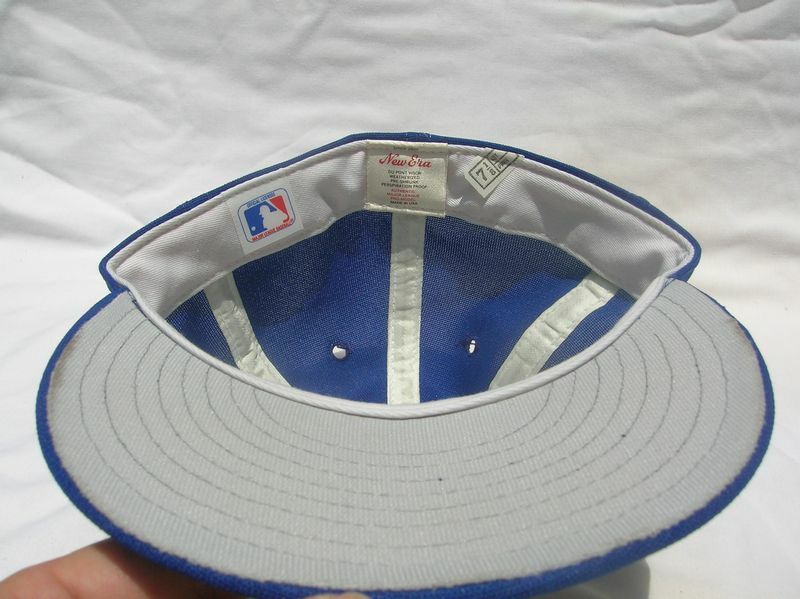 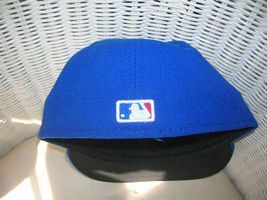 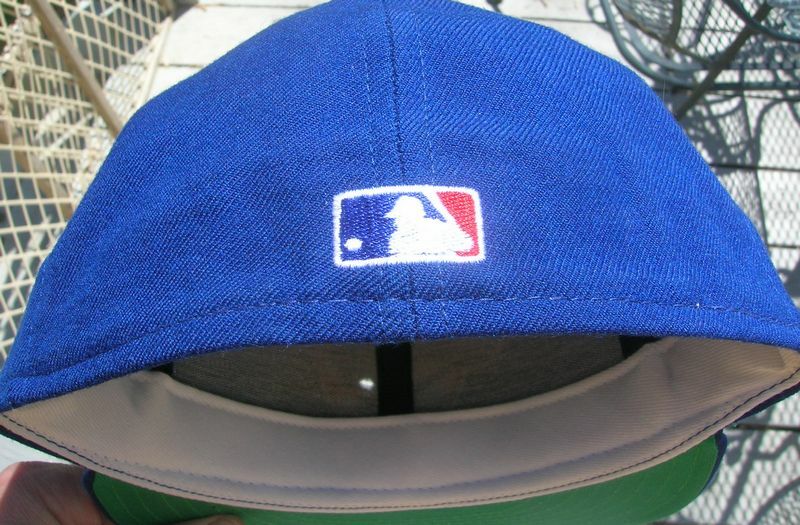 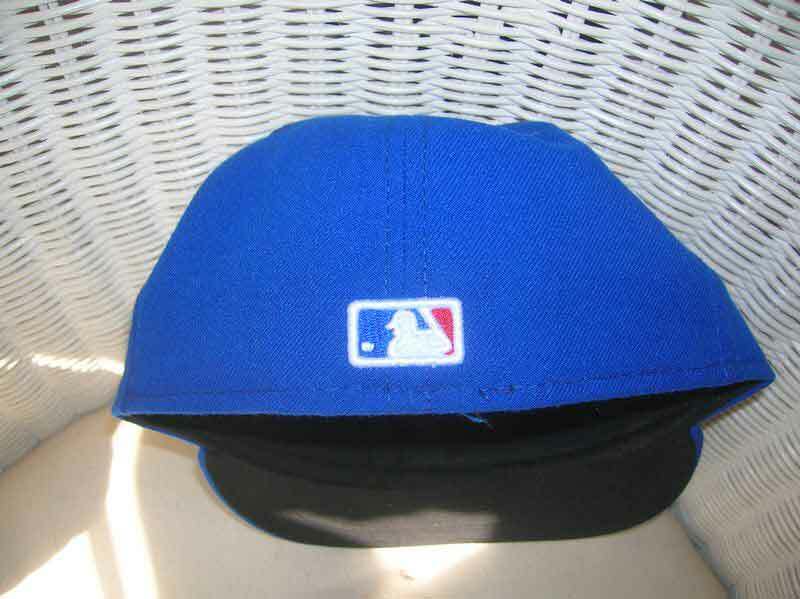 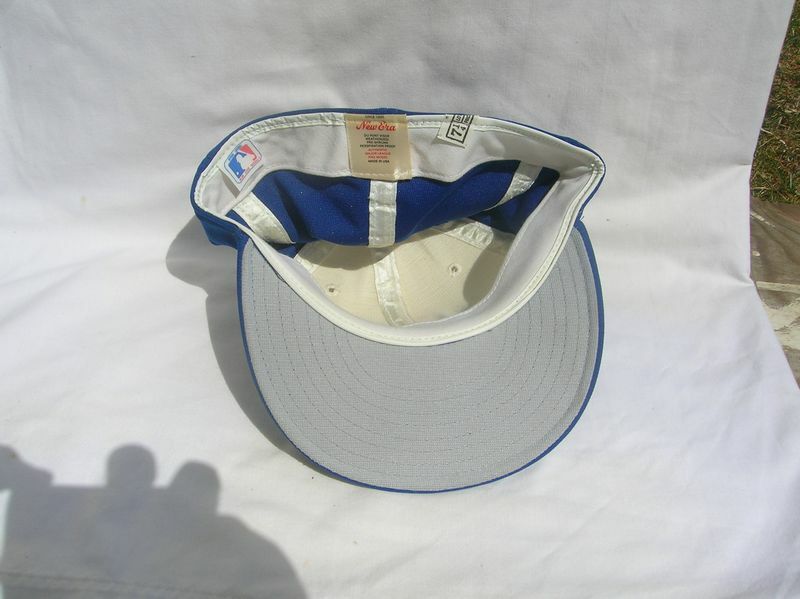 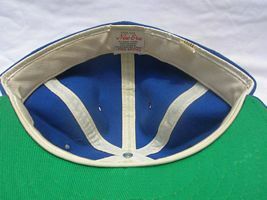 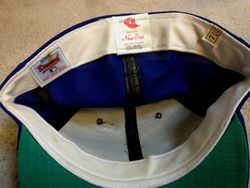 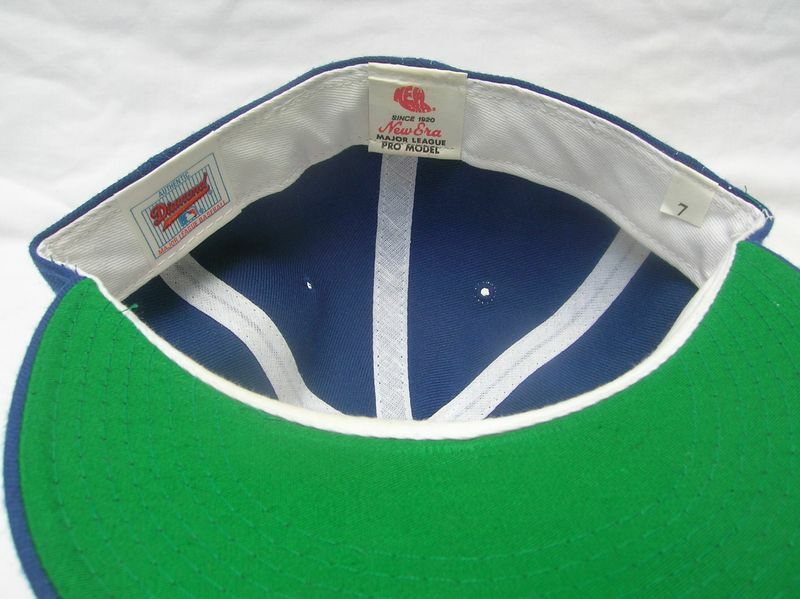 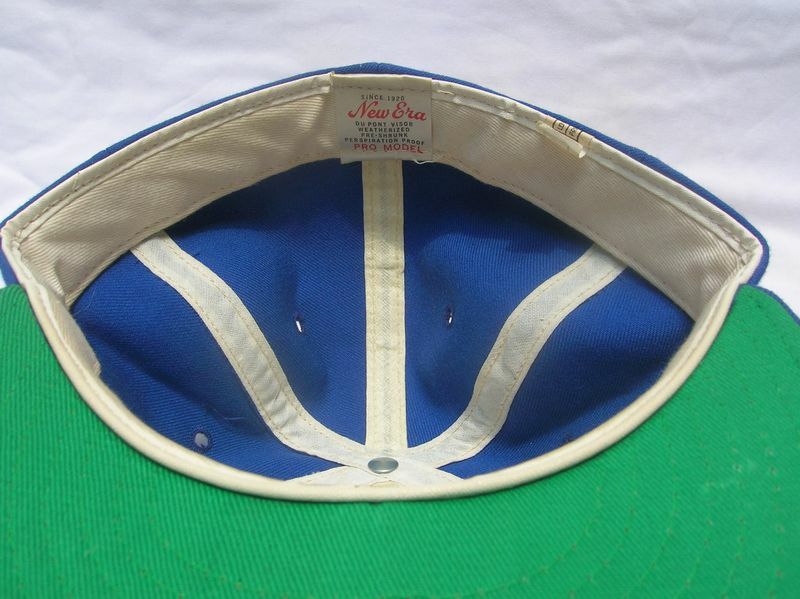 A solid blue nylon road cap is introduced in 1989. 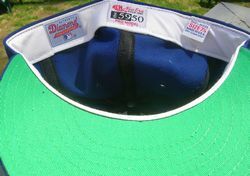 Nylon road caps also have green undervisors. A very subtle change, the light blue color gets a shade darker (see the feathers on the bird's head), but only on the home cap which changes from all-nylon to wool with a white nylon front panel. 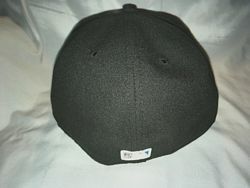 Road cap changes to all-wool. 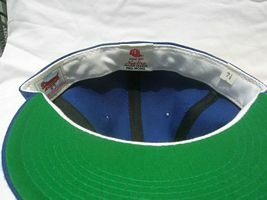 Undervisors return to green. 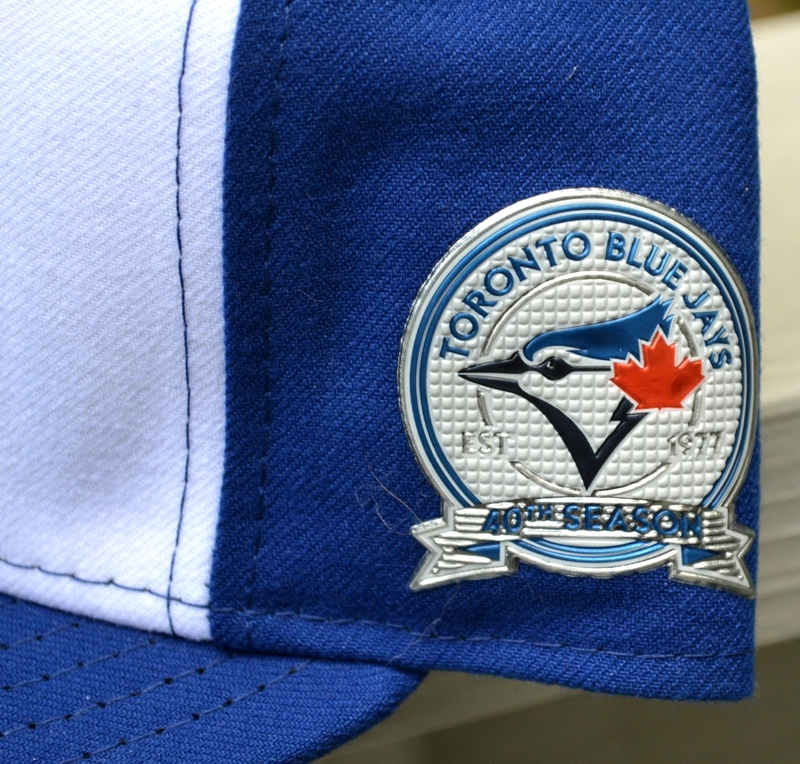 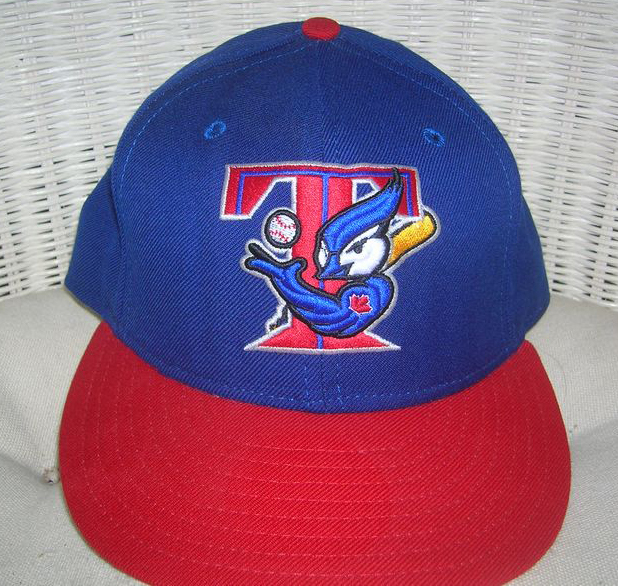 The light blue color gets a shade darker (see the feathers on the bird's head) on the road cap as well now. 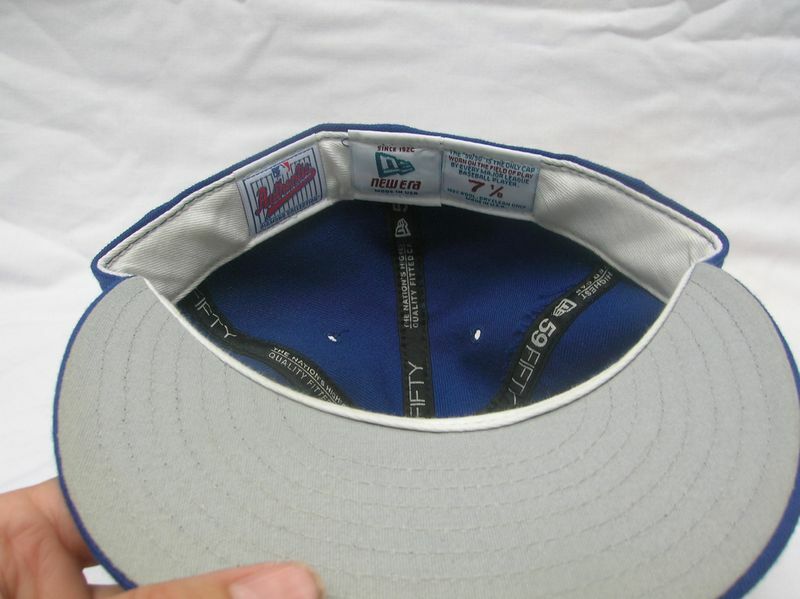 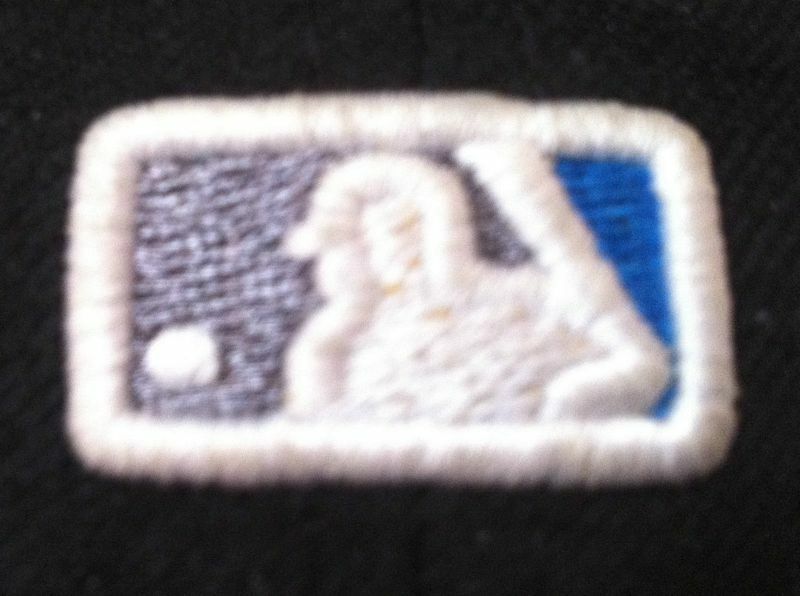 The MLB logo debuts on cap backs in 1992. 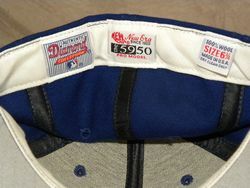 Early in the season, it was glued onto caps that had already been made. By mid-season 1992 the MLB logo was embroidered in a single team color. 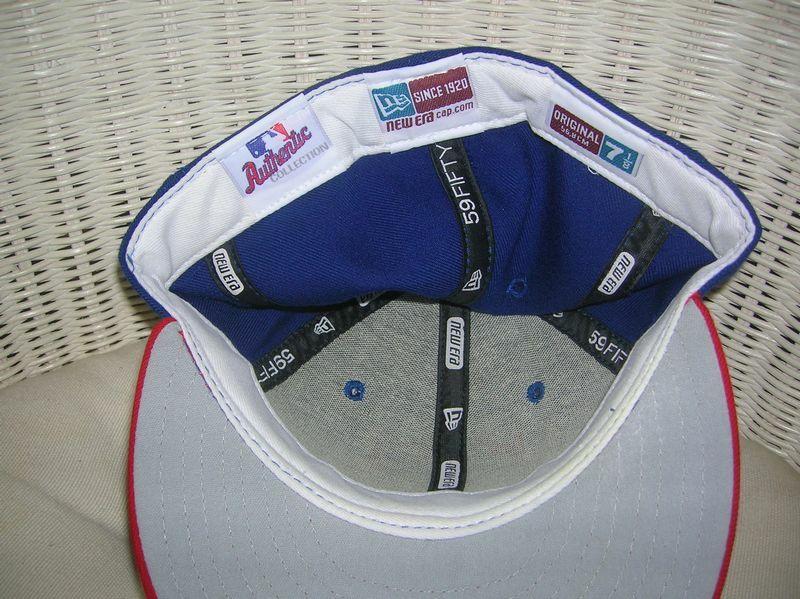 By the late season 1992 the MLB tag is embroided in dual team colors. Once again, the colors get a tad darker. 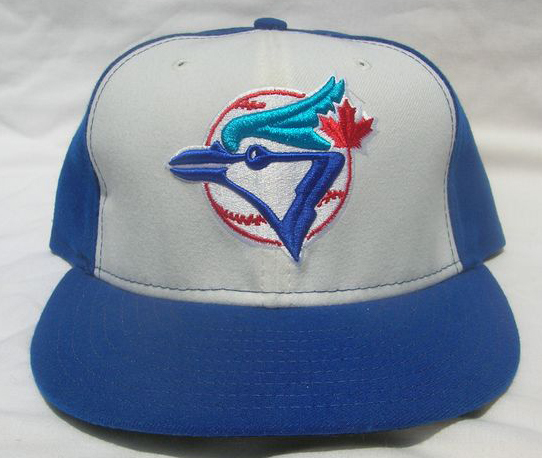 Especially the bird's feathers which are now turquiose blue. 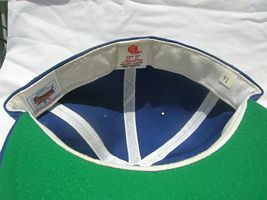 White front caps were worn at home only until July 1. 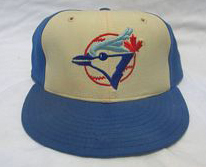 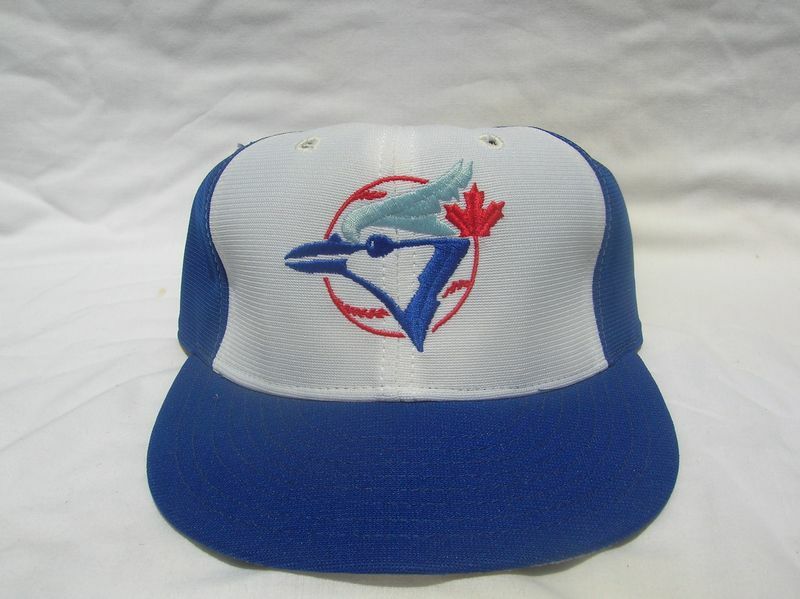 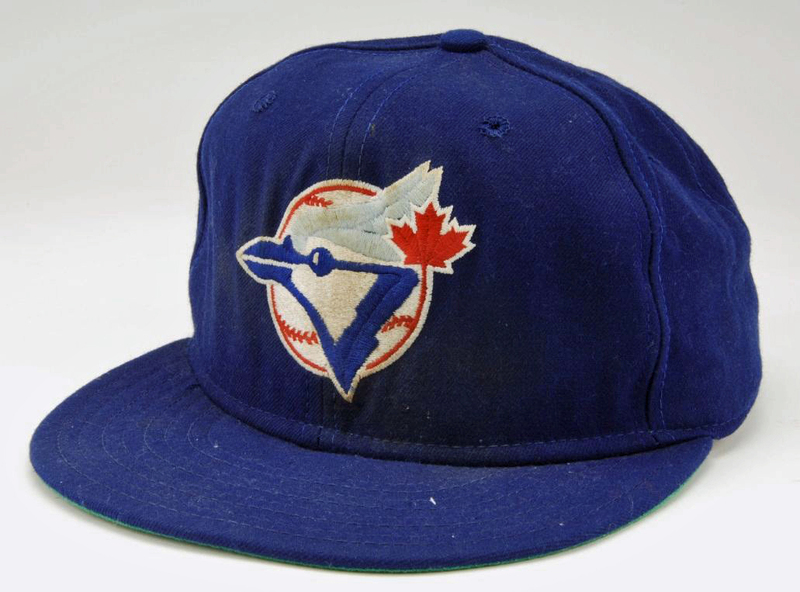 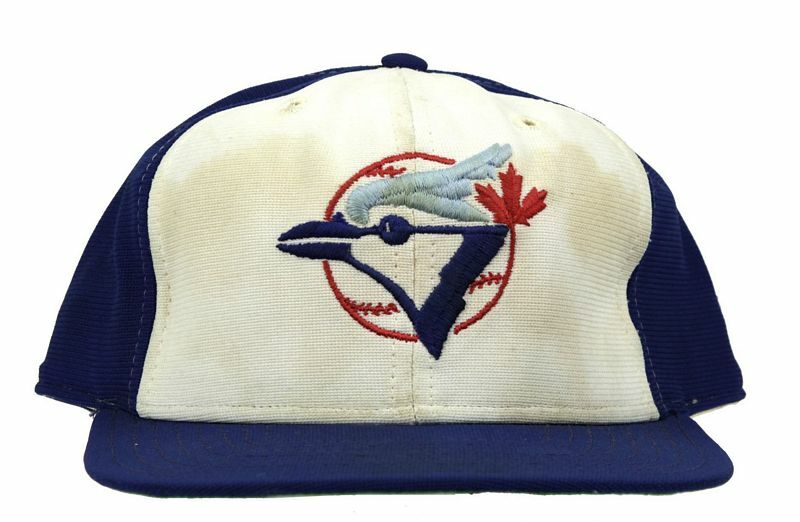 The Jays were playing poorly and decided to try the all-blue caps at home, started playing better, won another World Series, and never used white front caps again. 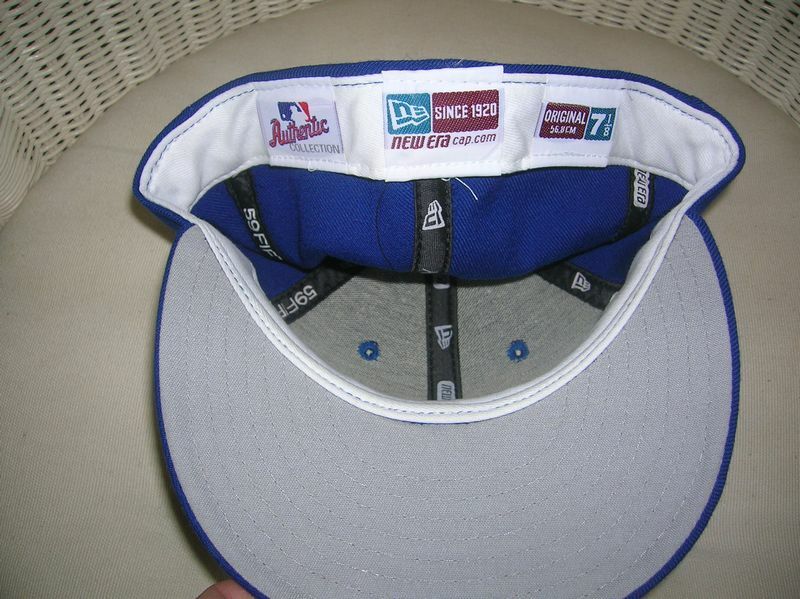 Undervisors return to grey in 1994 and the white front cap is officially retired. 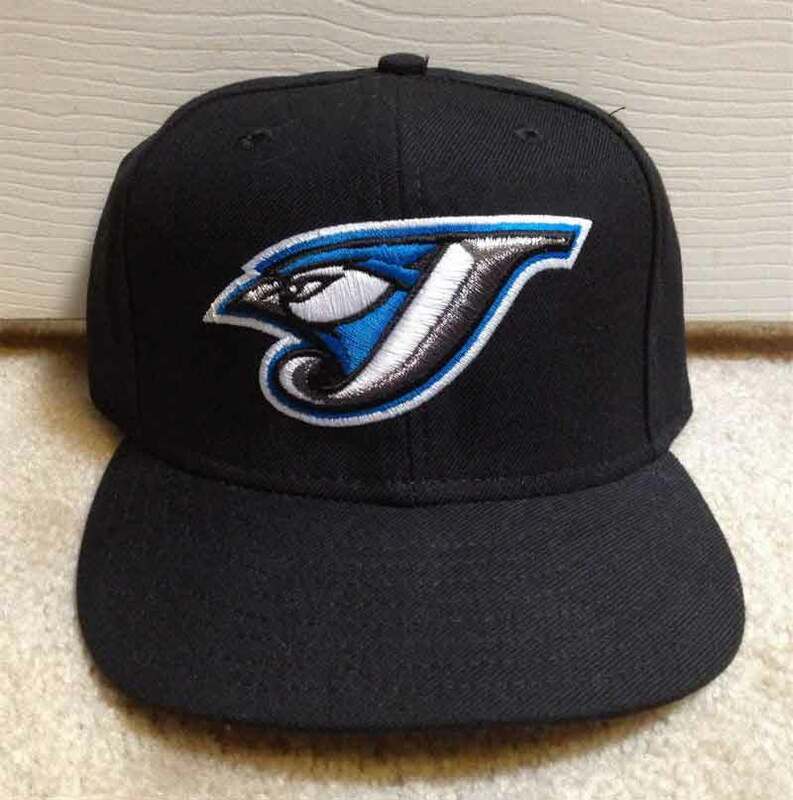 The Jays redesign jerseys and caps. 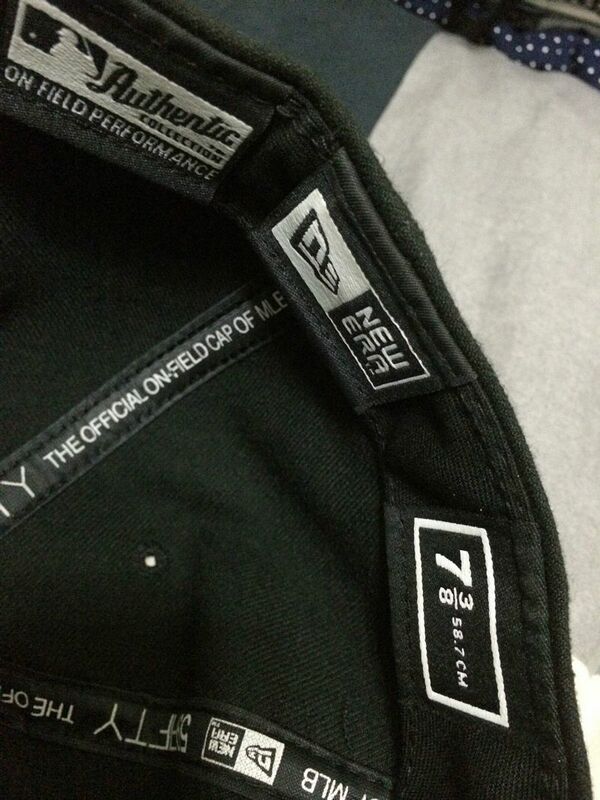 Logo embroidery is raised a bit. 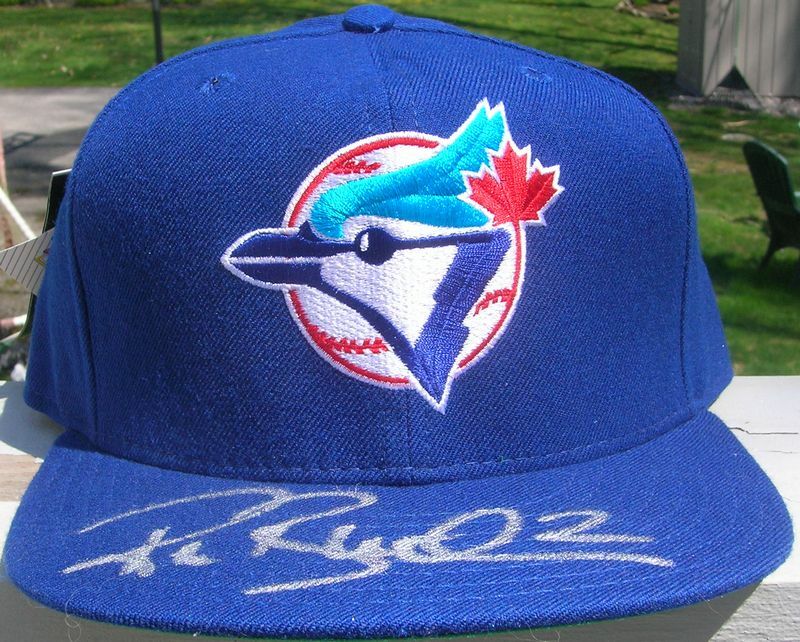 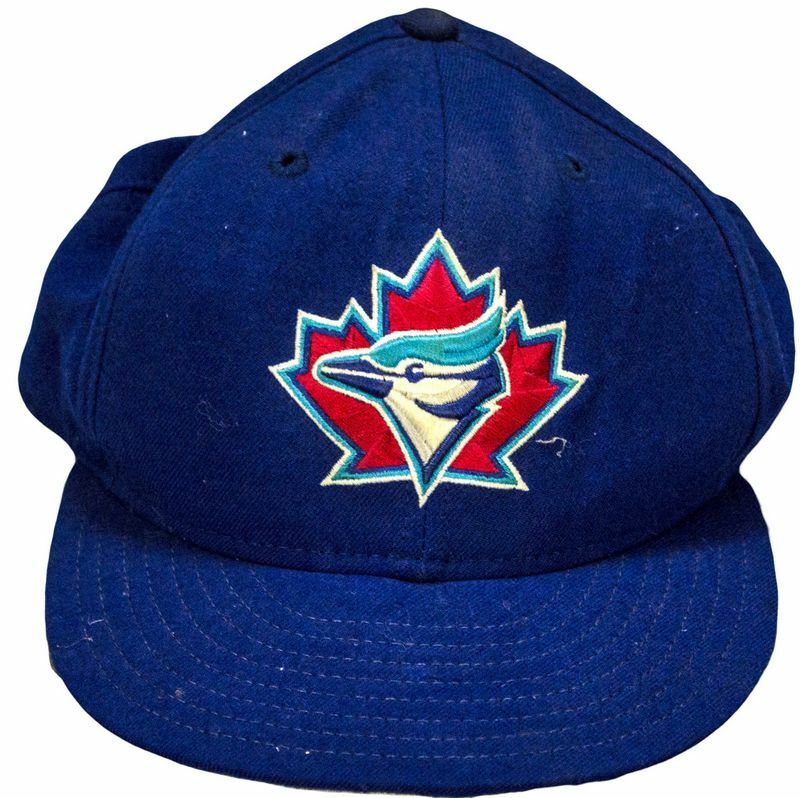 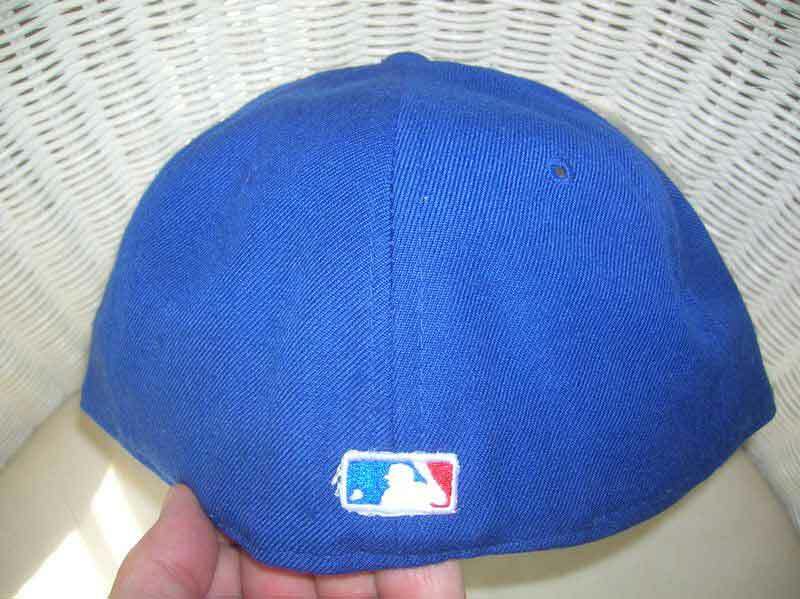 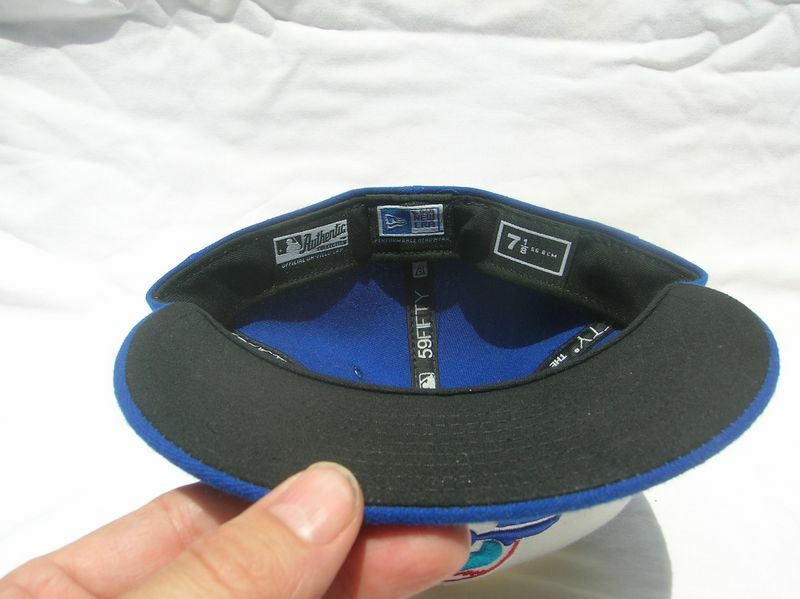 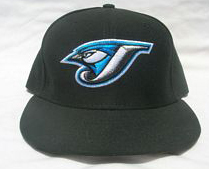 The Jays use their former batting practice caps for all of 2003. 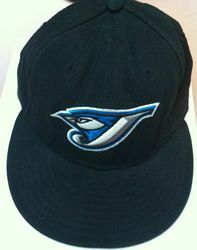 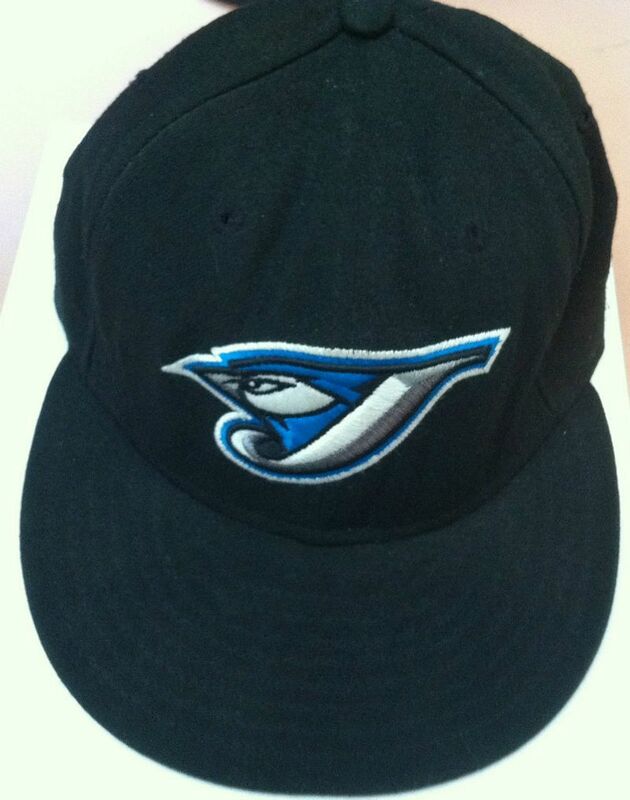 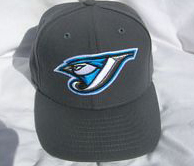 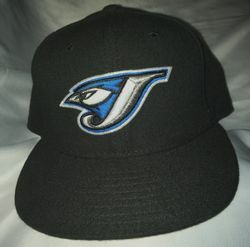 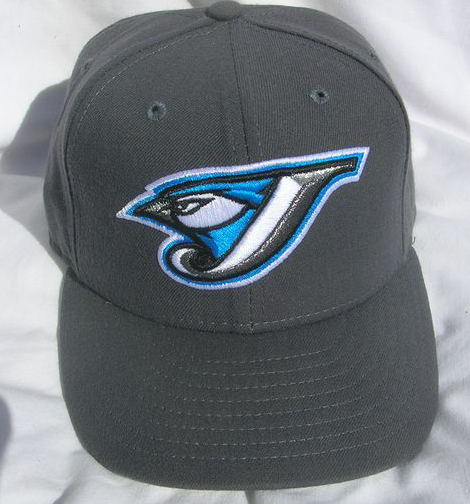 The Toronto Grey and Black Jays debut in 2004 with grey caps for home, black for the road. 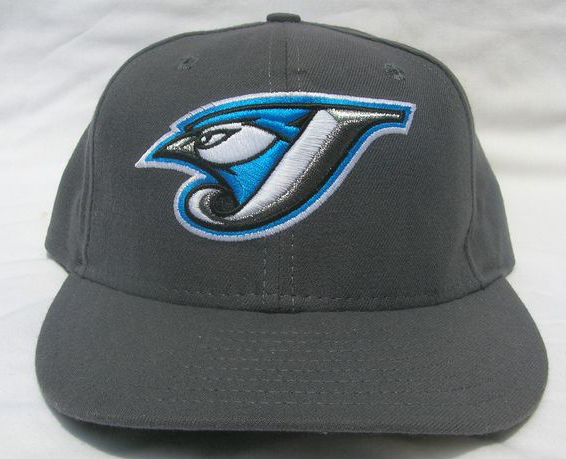 The new logo is a mad bird sneaking out from behind the letter "J". 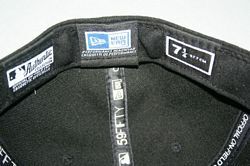 Pictures show they wore black undervisors in 2004. 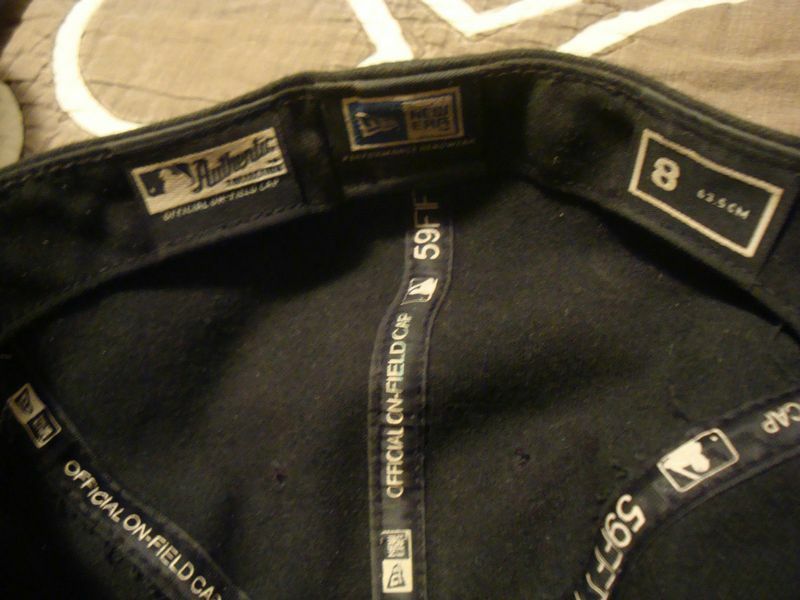 Anyone have a 2004 black cap? 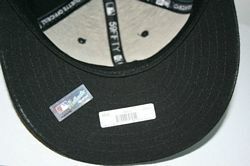 It will have the same tags. 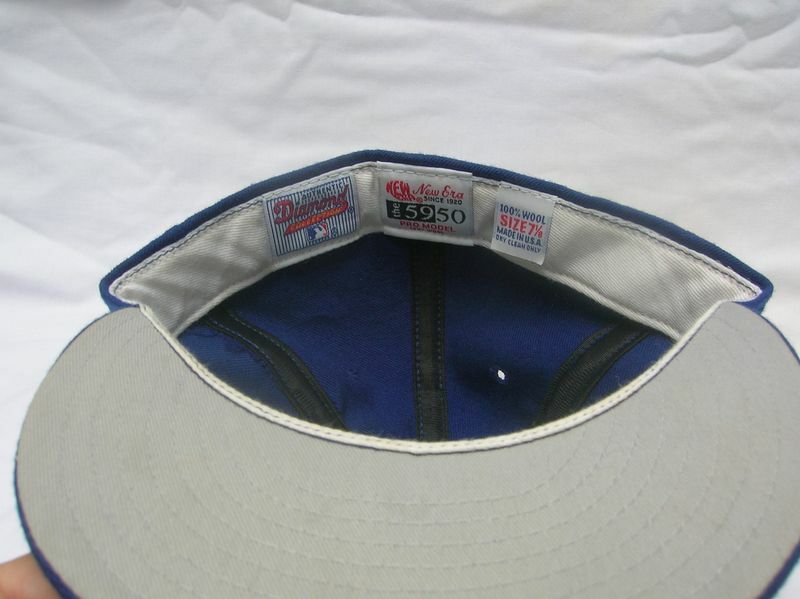 Undervisors return to grey as seen in pics from that season. 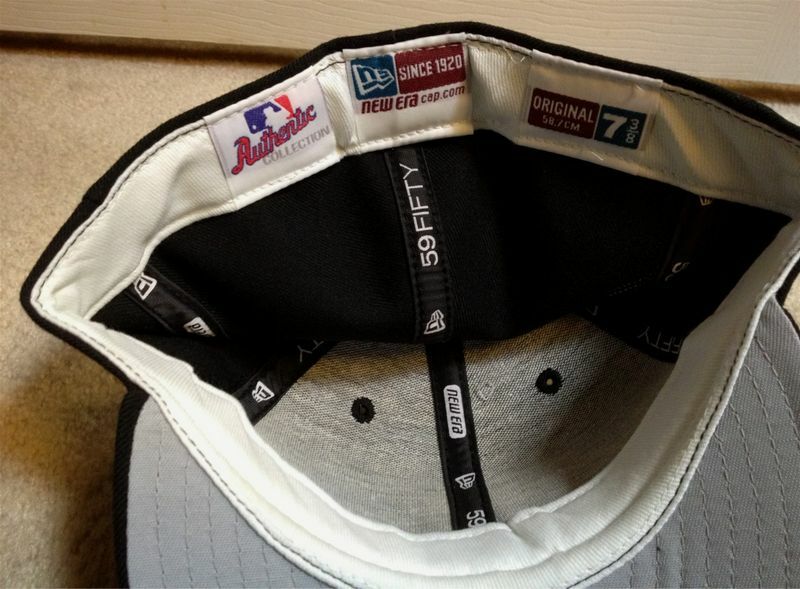 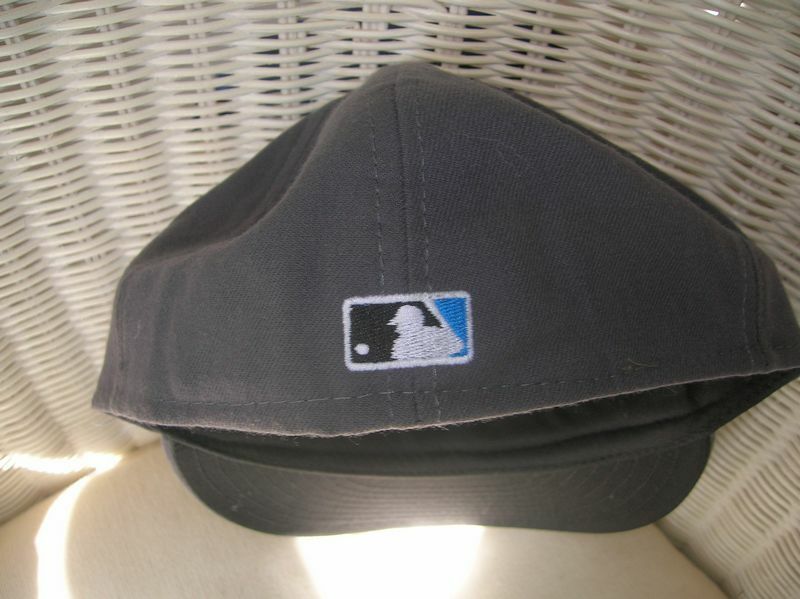 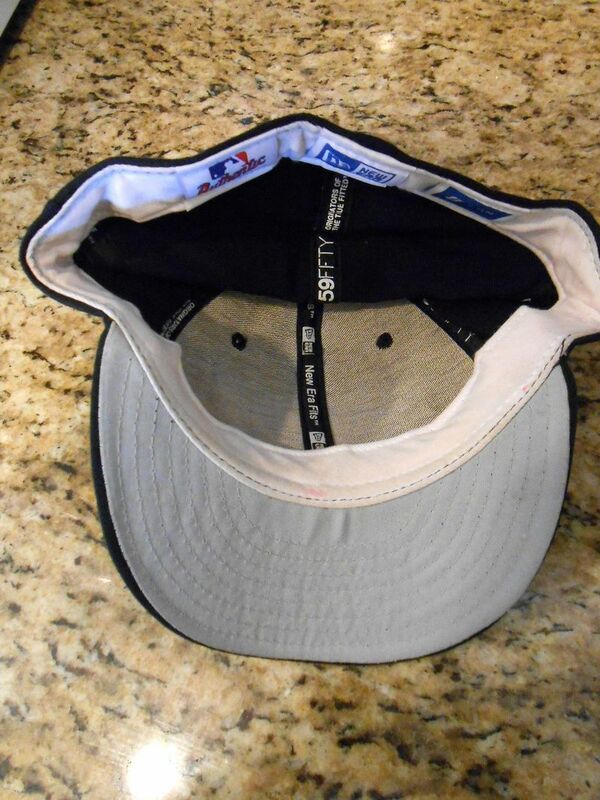 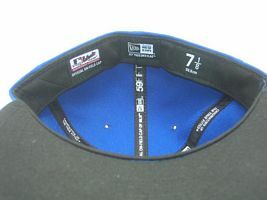 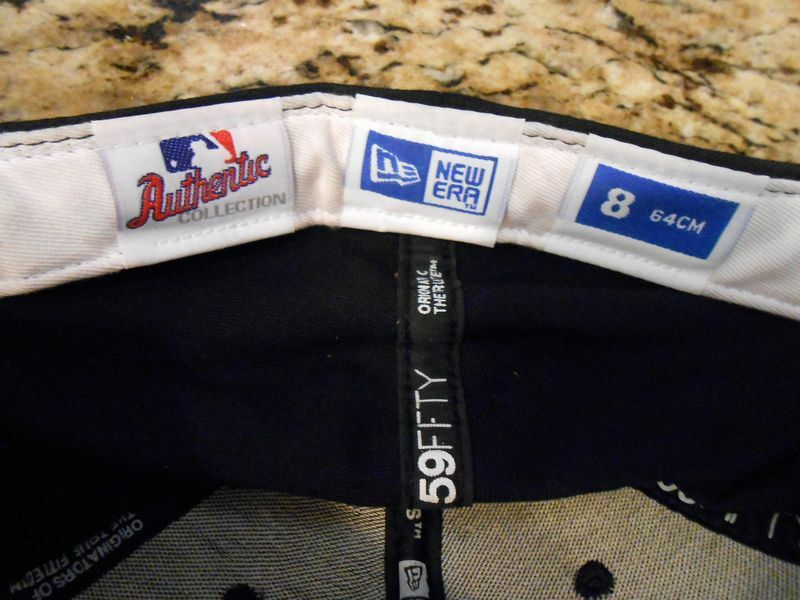 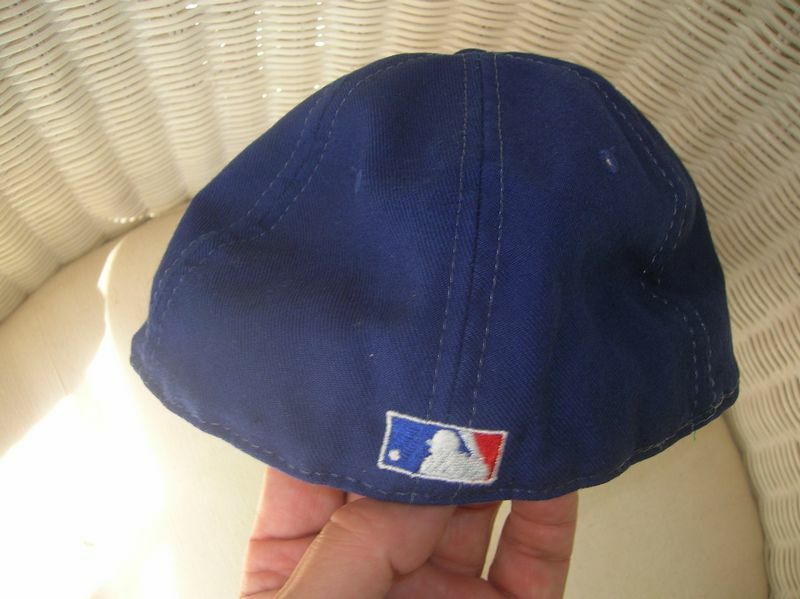 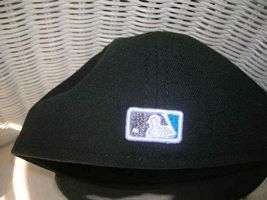 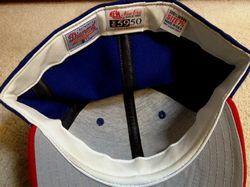 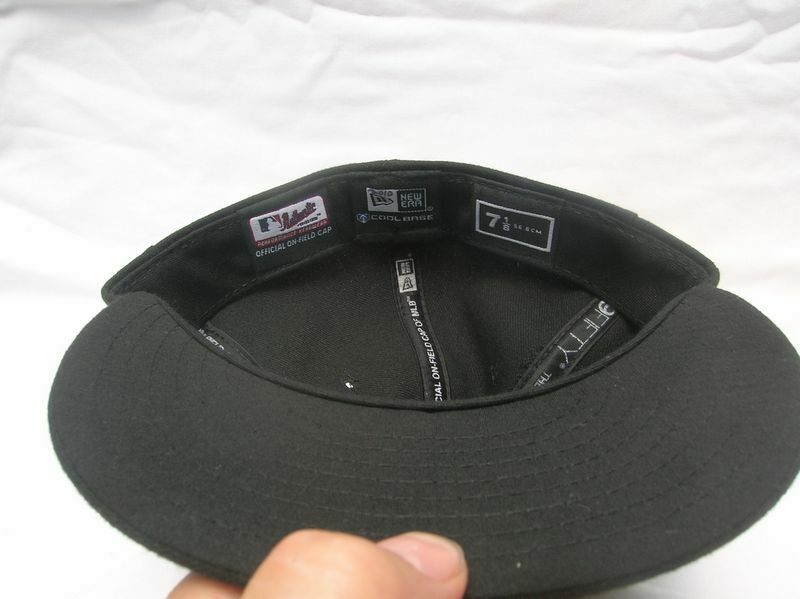 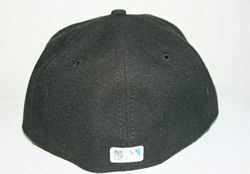 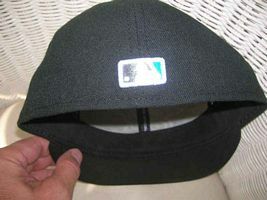 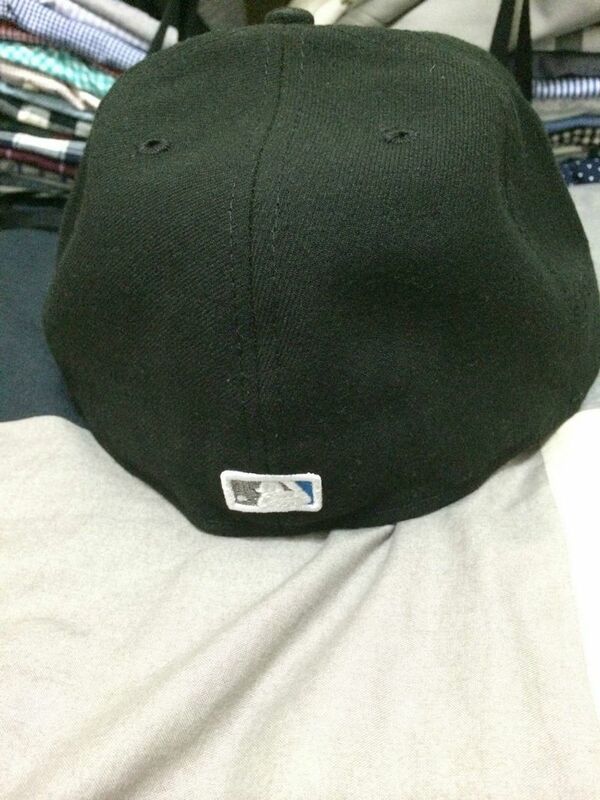 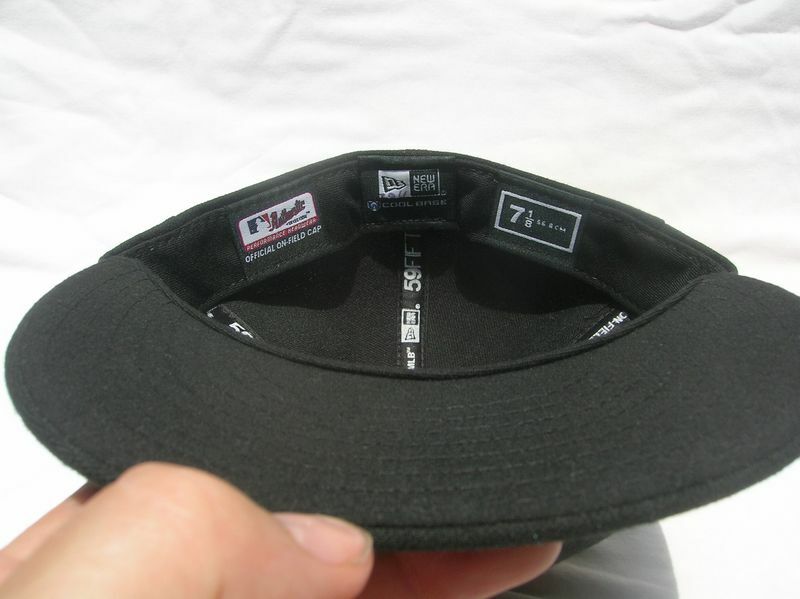 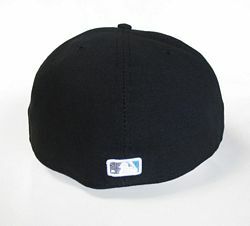 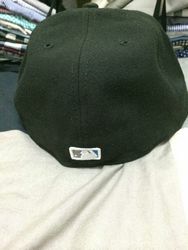 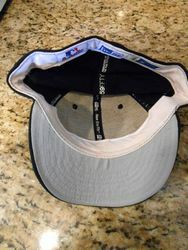 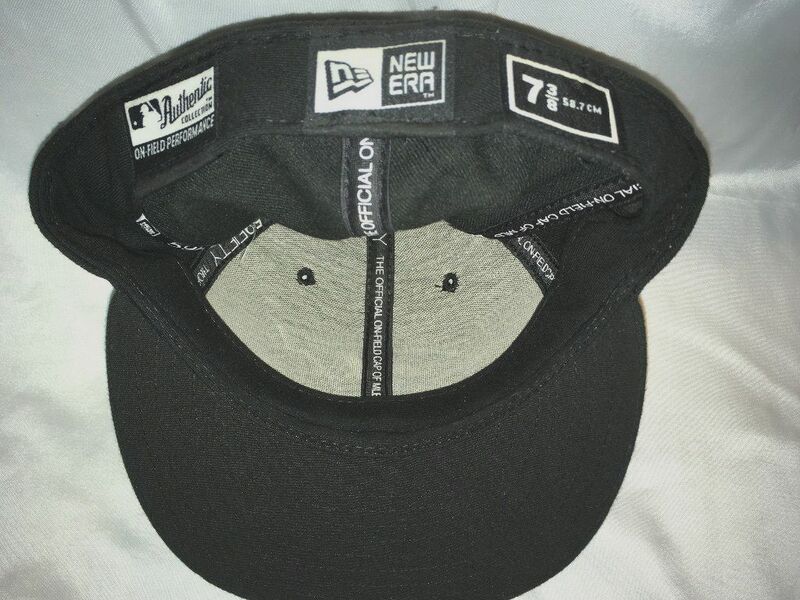 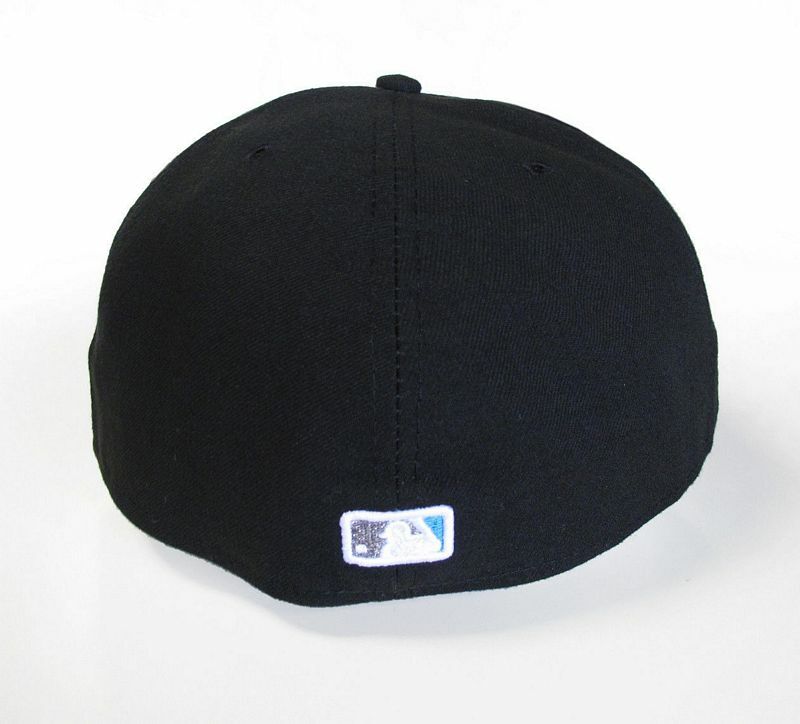 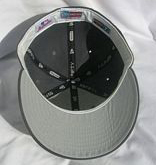 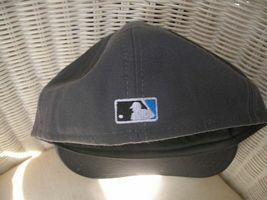 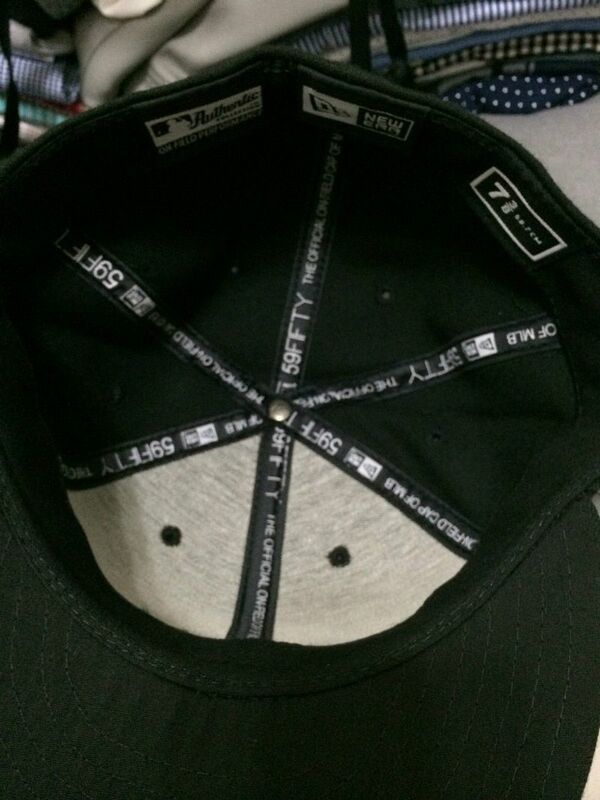 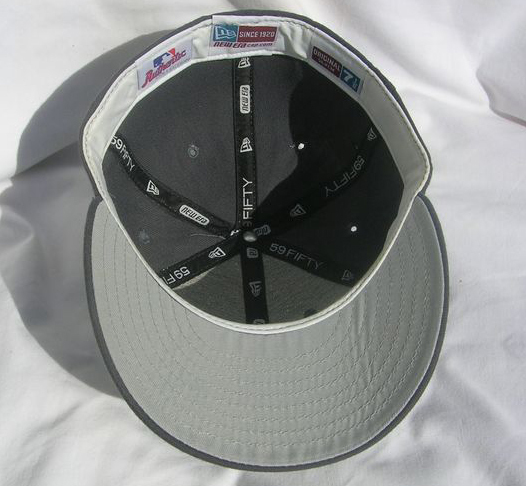 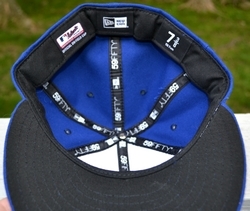 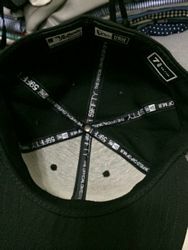 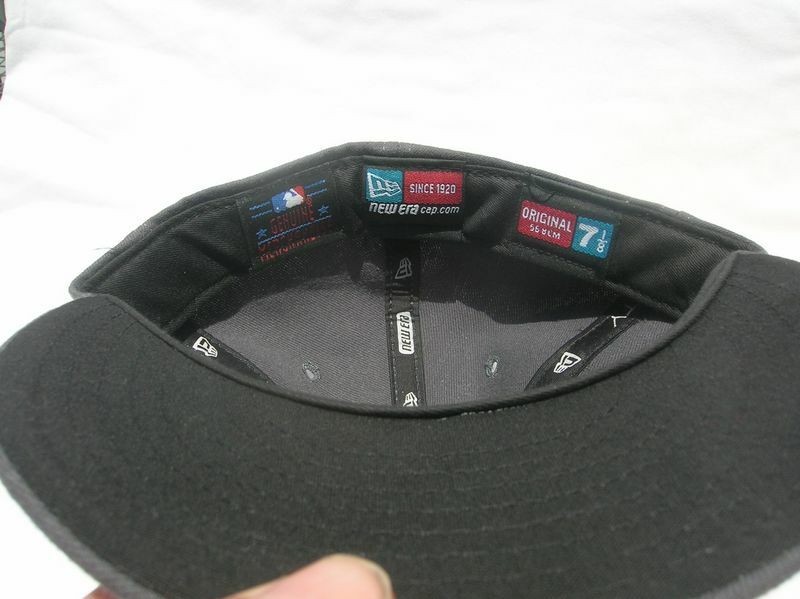 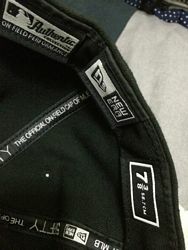 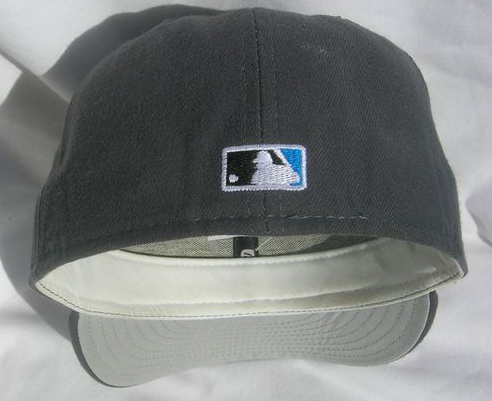 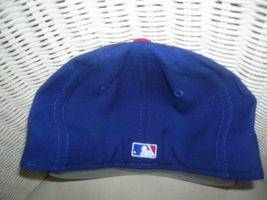 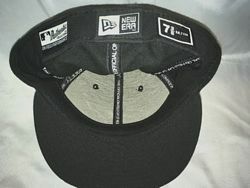 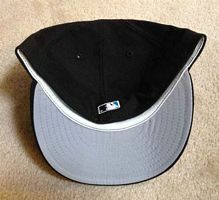 Polyester caps replace wool, and the undervisor returns to black. 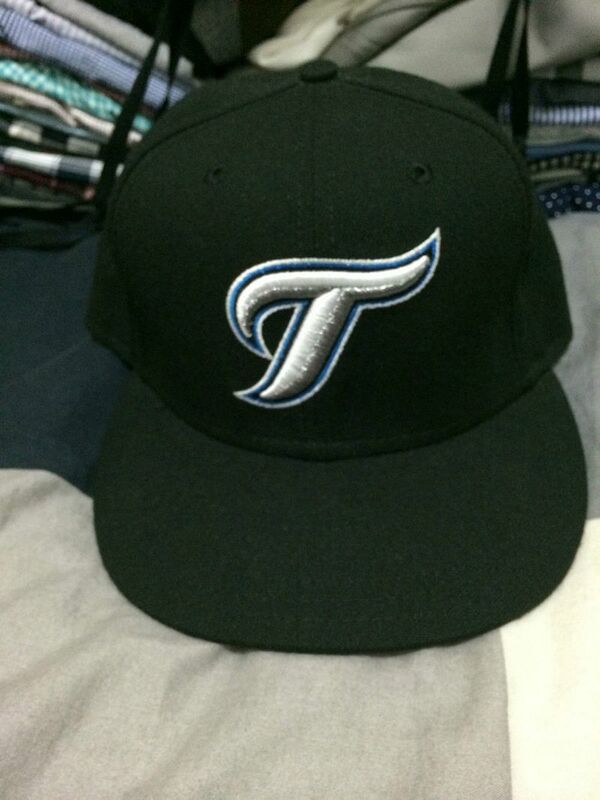 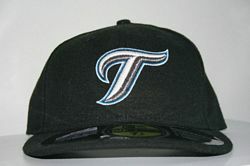 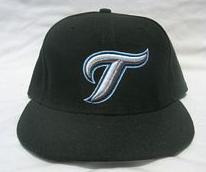 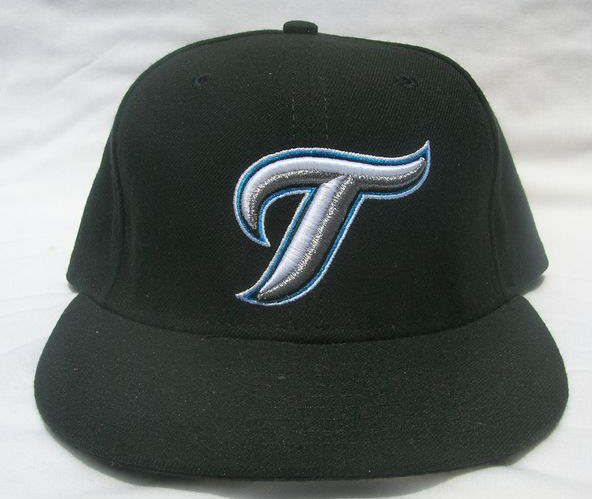 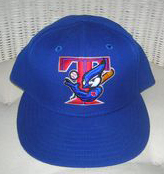 An alternate "T" logo cap introduced - looks a lot like... an ocean wave to me. 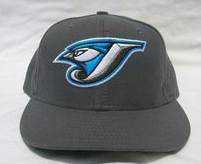 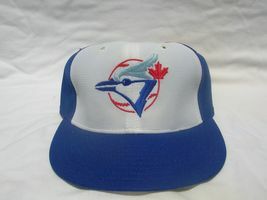 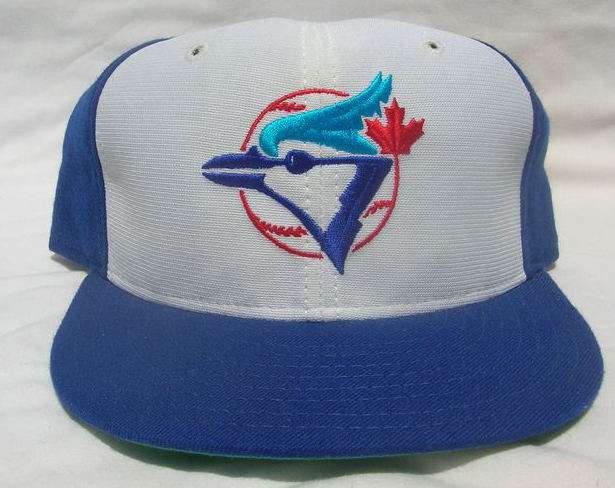 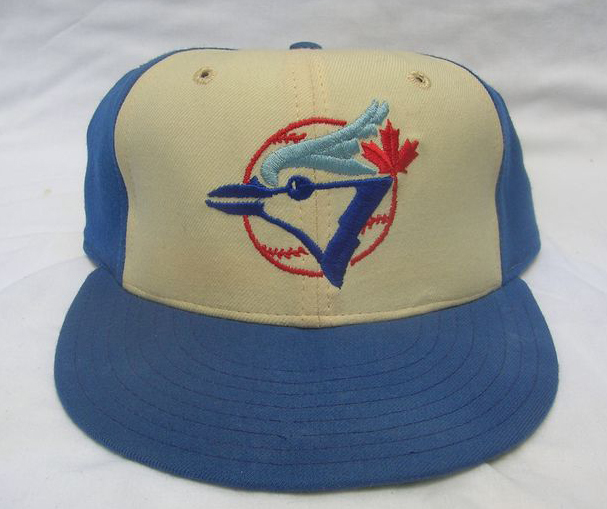 The Jays wear throwback powder blue road jerseys on Fridays and introduce an alternate cap. The throwback alternate is dropped. 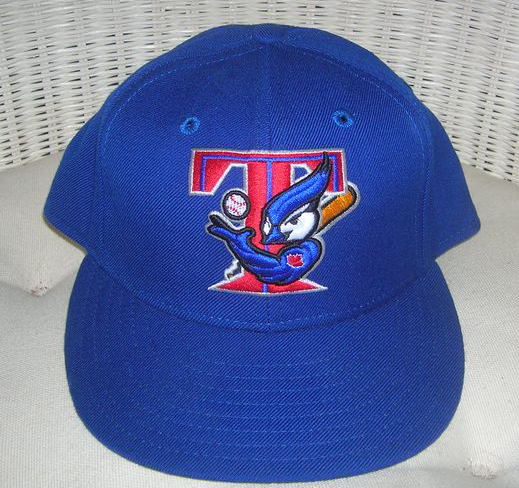 Highly popular return to an updated traditional look. Red BP cap used with home and alternate jerseys a couple times. 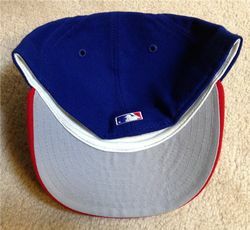 Red BP cap not used with regular jerseys. White front panel cap announced to great fanfare but is worn just once each in 2015 and 2016. 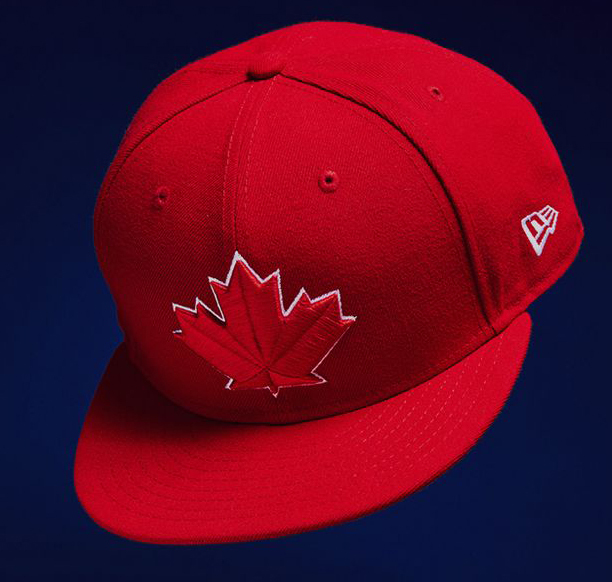 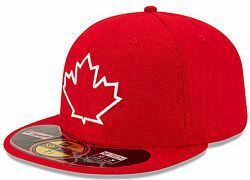 Red cap added for celebrating the 150th anniversary of Canada's Confederation.